I sought of found with this modelling lark that you can run out of things to do, so, the reason I started in the first place was because I had a plan for MFV Eileen, had it for many, many years, started it twice and for reasons unknown didn't get very far. I was advised by others to buy a kit, which would be an easier build, hence the Fast Patrol Launch build. Here is a quick catch up to where I am now. 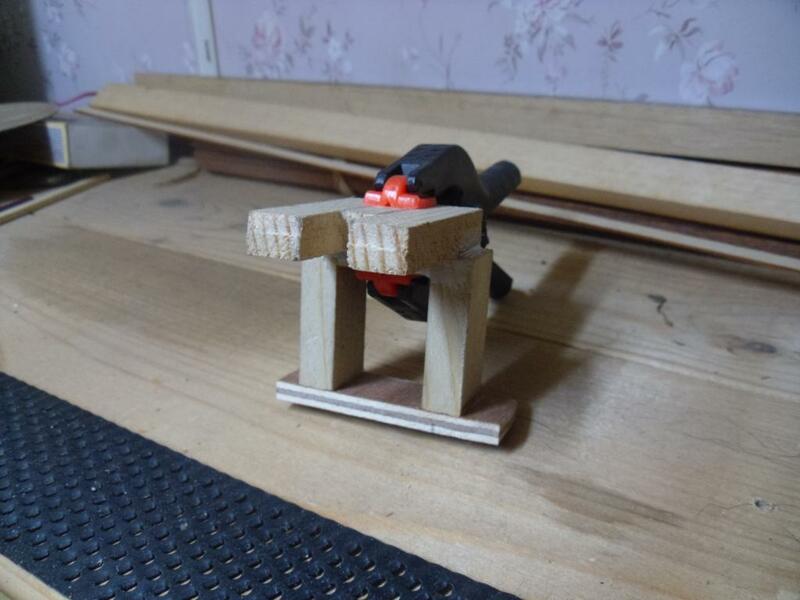 I have a Burgess Band Saw and used it to cut out my basic shapes. 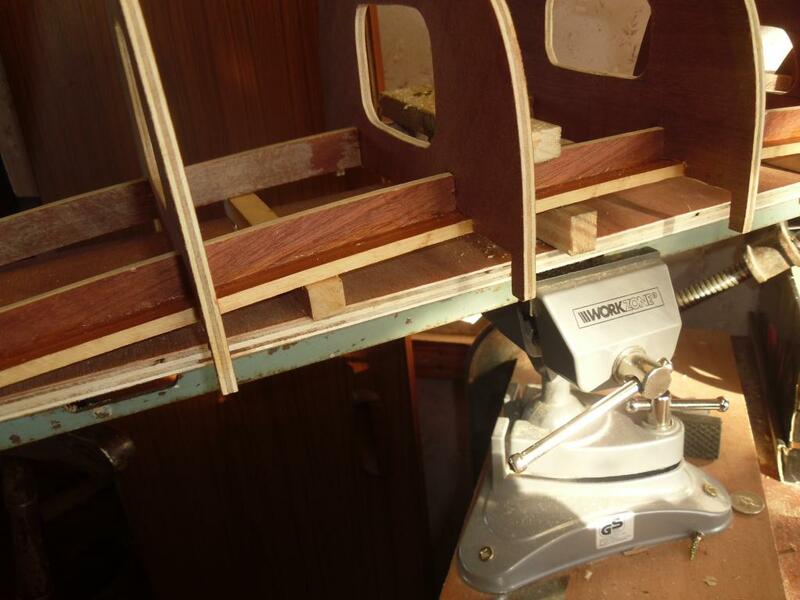 The keel/centre board and sheer boards are cut out. 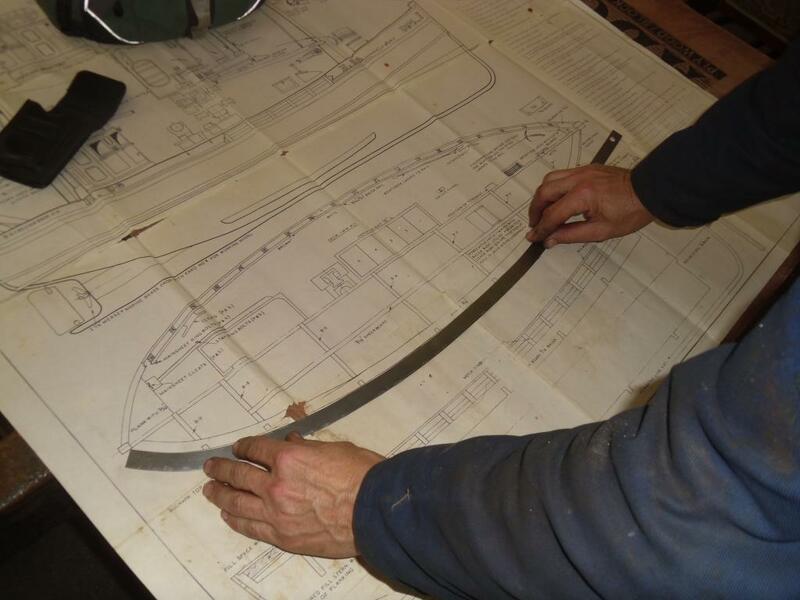 Fitting the stern tube and keel doublers. 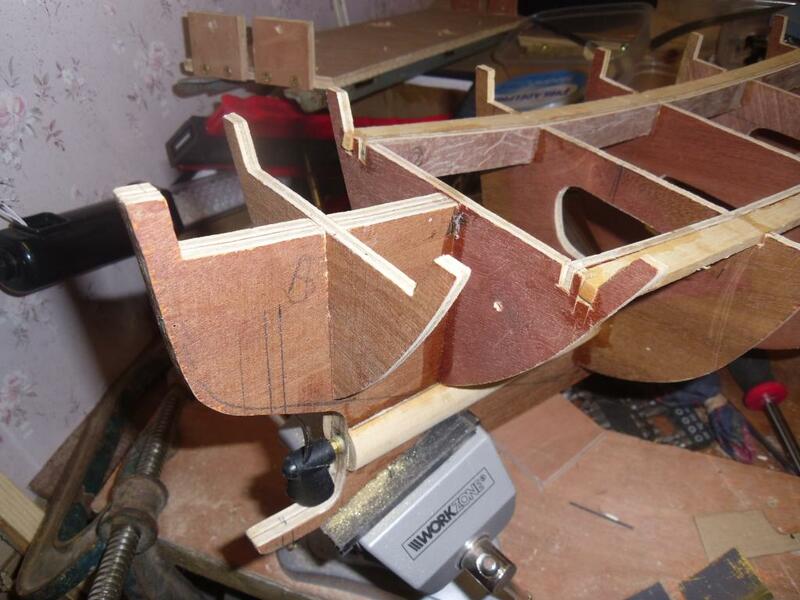 Trial fit of a few bits. Made a little mistake but I will repair and it won't be seen anyway. 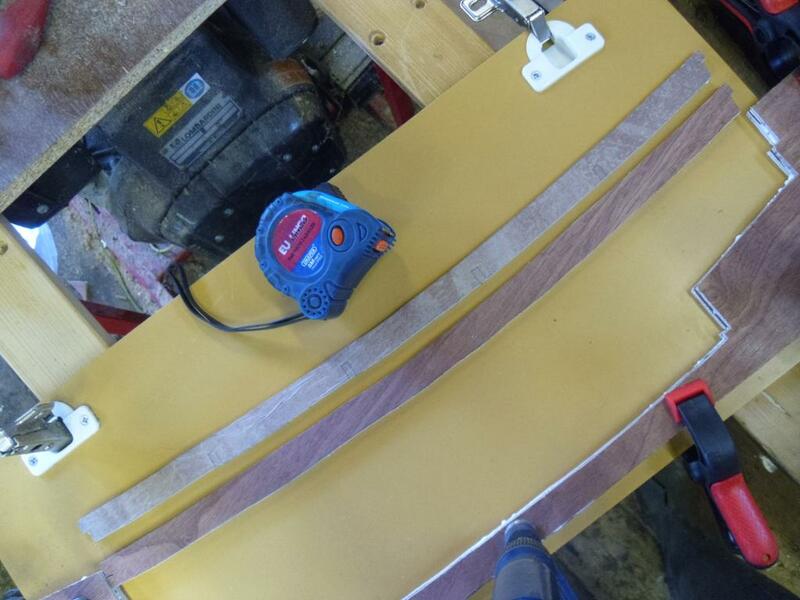 My friend made me some profile gauges for the sides on his Ekold shrinker/stretcher. This is where I am now, these are partially glued. 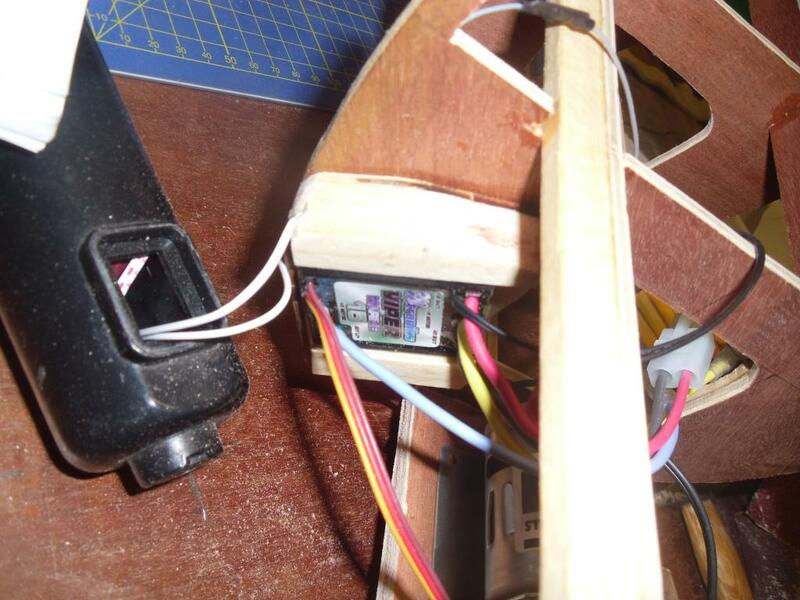 Hi all, a little help required, I don't know what motor or servo for the rudder to use, some advice from you knowledgeable folk for a novice on which type and size and where do others get these bits from please. For a motor I would imagine a 545 would be ideal - it looks as though it will be a substantial model, but you are not looking for great speed. As for a servo, I find the miniature ones have sufficient torque for non-racing models up to 30 or so inches, but a standard servo would do fine. 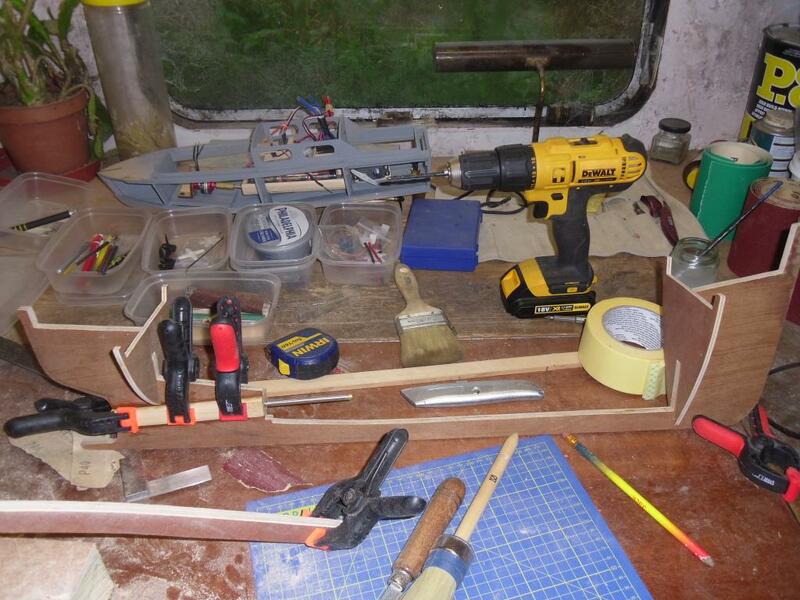 As for supplier, then either Cornwall Model Boats or Component Shop can supply both the above, and are very reliable in my experience. 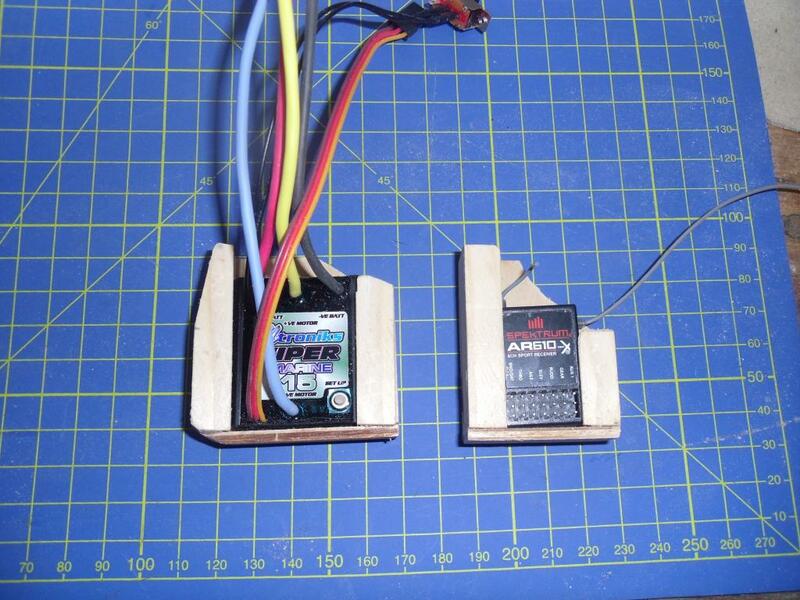 As for a servo, I find the miniature ones have sufficient torque for non-racing models up to 30 or so inches, but a standard servo would do fine. 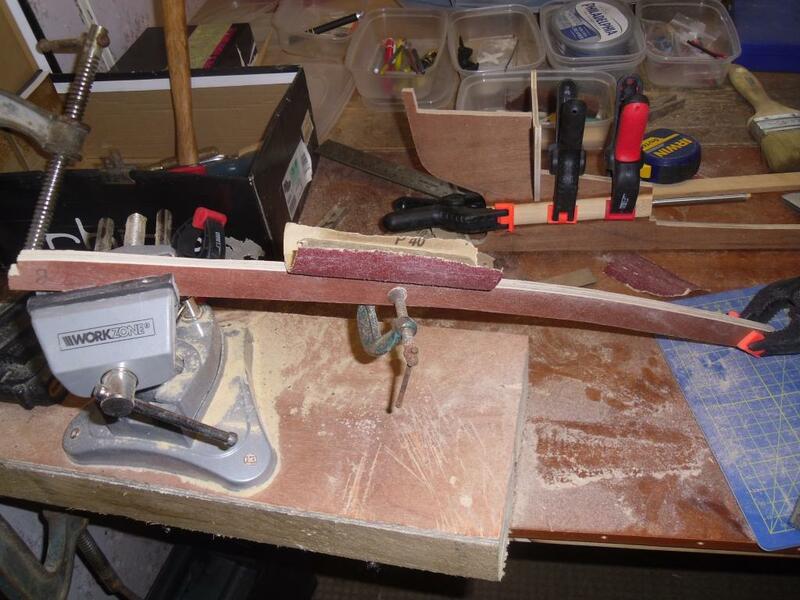 As for supplier, then either Cornwall Model Boats or Component Shop can supply both the above, and are very reliable in my experience. What does 545 stand for, probably obvious but not to me the novice. The difference is the physical size, as well as the power and operating speed. Thanks Barrie, got that now, next question, what motor Bracket is required I'm sure when I get onto boat build 3 I will know a little more, I'm planning that one now, a "Great Lakes Freighter"
You can get a bracket designed for the motor - check the web site, there is an option to buy the motor with a mount I believe. Ok, assuming I go with this 540 series motor with 5 poles, what battery power do I/can I use ? And what speed controller would I need ? A 10 or 15 amp ESC would be fine. 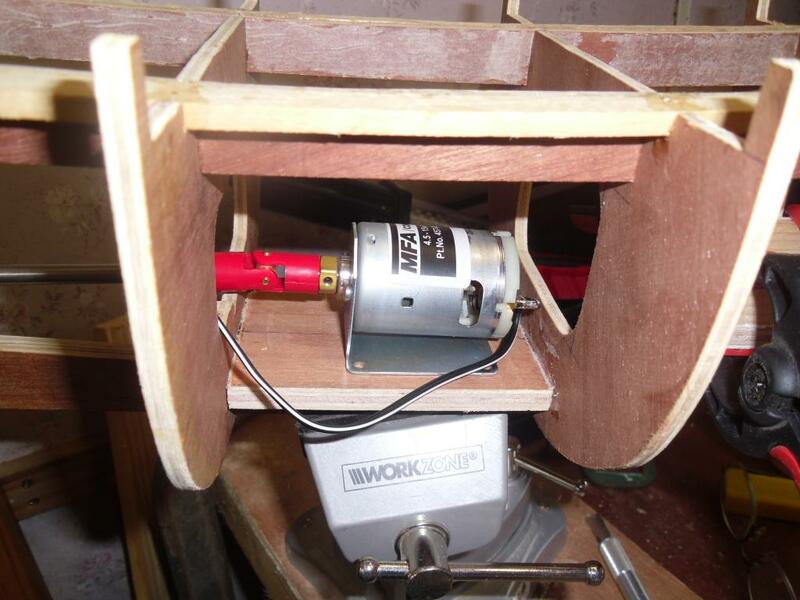 That is a very low current motor. 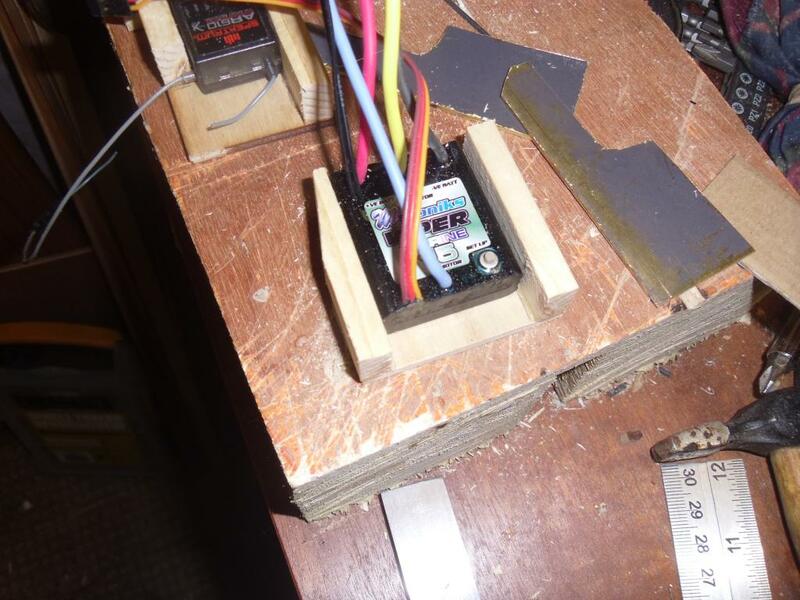 As for battery, 6 to 12 volts depending on your preference for NiMh or SLA - I wouldn't recommend LiPo for this application. 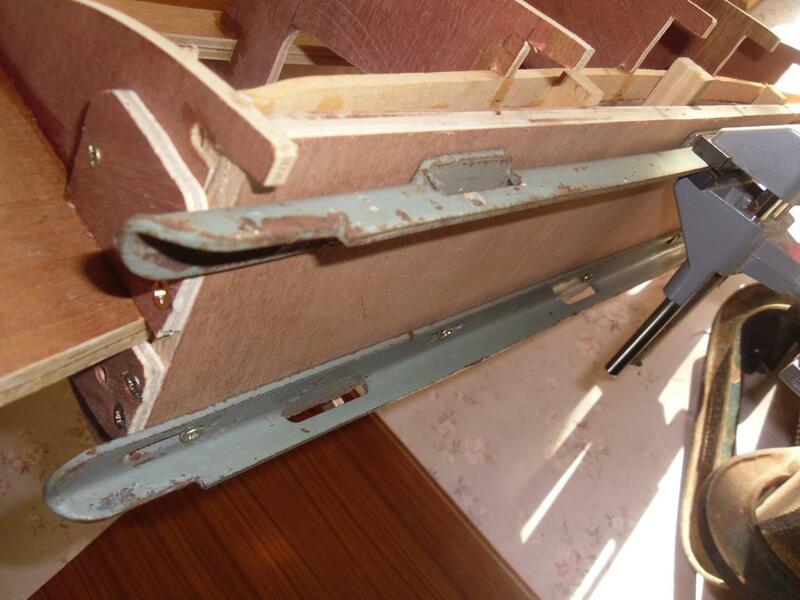 I had a little problem with the sheer boards, they were a bit kinked or wigglier that I liked, pondered quite hard on this and came up with the idea of putting a piece of hardwood at right angles and to the outside as not to interfere with the access openings I require for electrics etc. 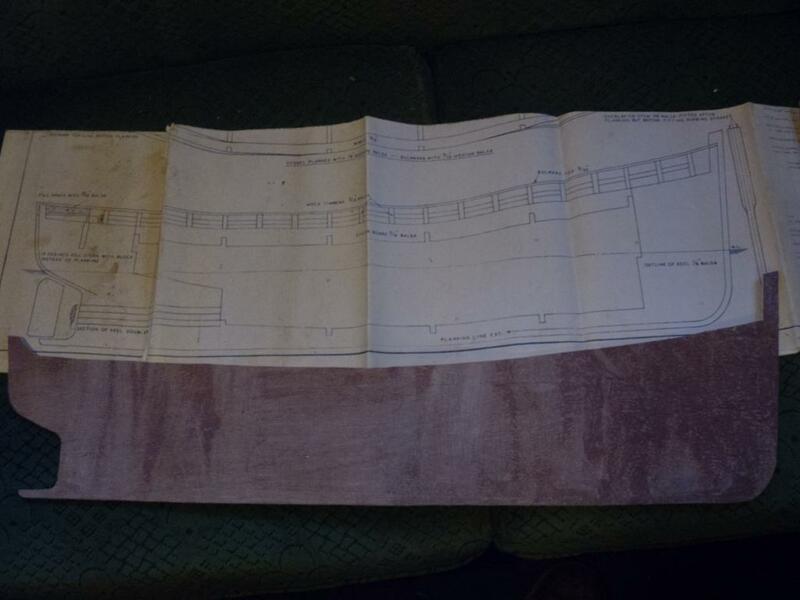 I was given an old wardrobe which was edged with some hardwood, some teak like in colour (thought I would save this for decking) and some lighter coloured stuff, not sure what though. 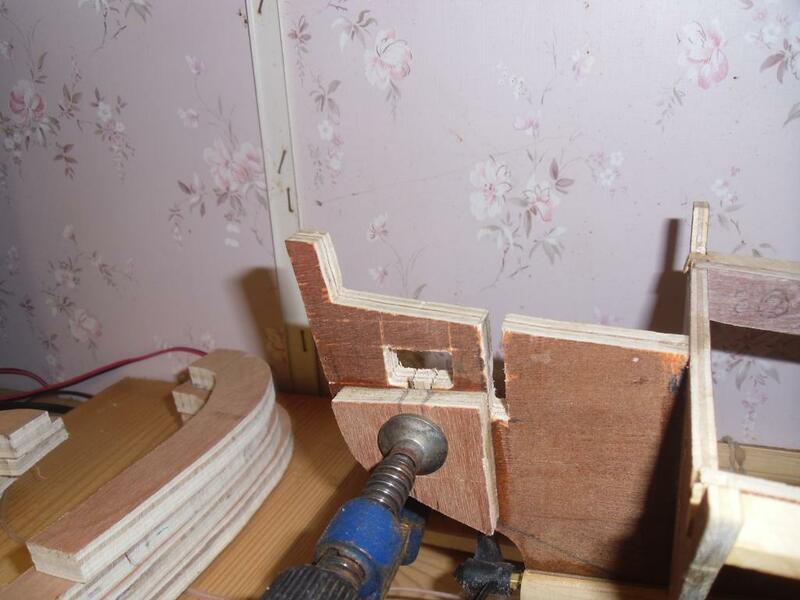 I have already cut the lighter coloured bits into some planks of 2mm thickness but still have more if I need to correct my mistakes. 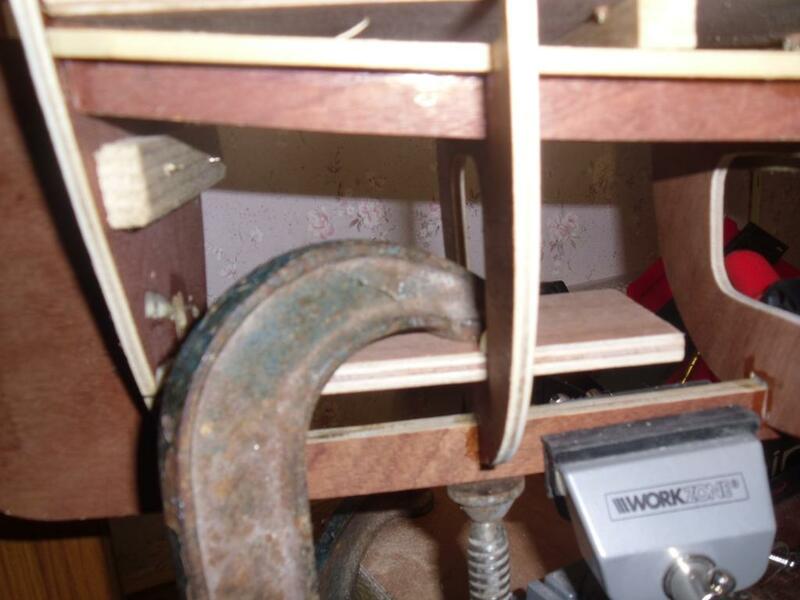 The first shot shows planks cut on the band saw, if you look at the left you will see a plank I twisted as a test and it seems to be very pliable, so I think good possibilities. 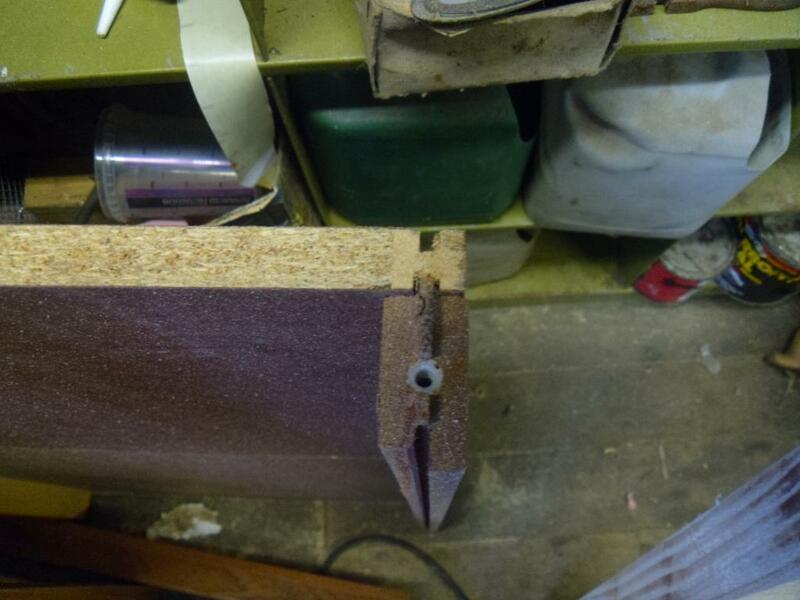 Bits of the old wardrobe which were my source for these planks. 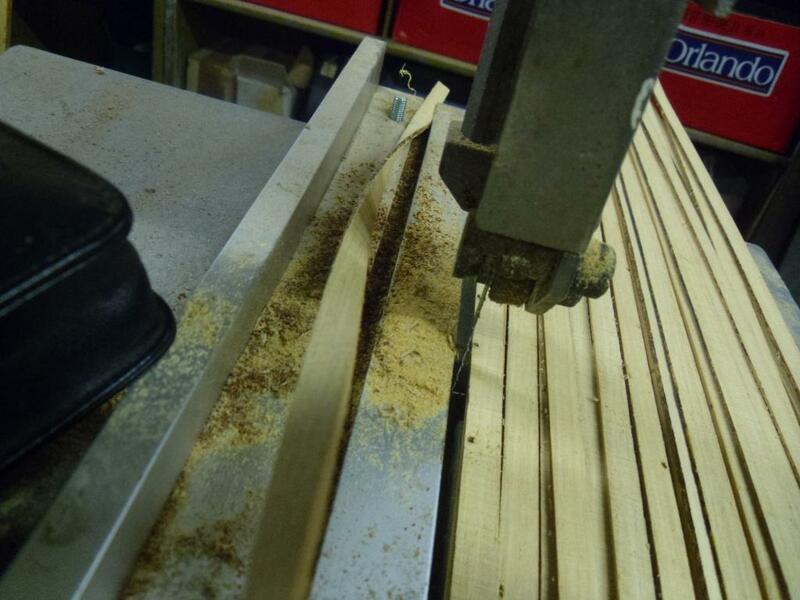 Now I remember, I also cut up the teaky stuff for decking too. Postman, elastic bands! You’re lucky ours must sell his because we never get any left around. Wardrobe recycling again, I think you do more than you are telling us. Another nice build, more piccy’s please. I asked the relief postlady for a few as they would be handy and they just kept coming, now I have a carrier bag full, I had to ask them to stop leaving then as I think I must have as many as the Post Office do. I found I had a little discrepancy in the deck level, about an eighth of an inch from one side to the other which I thought a little to much. 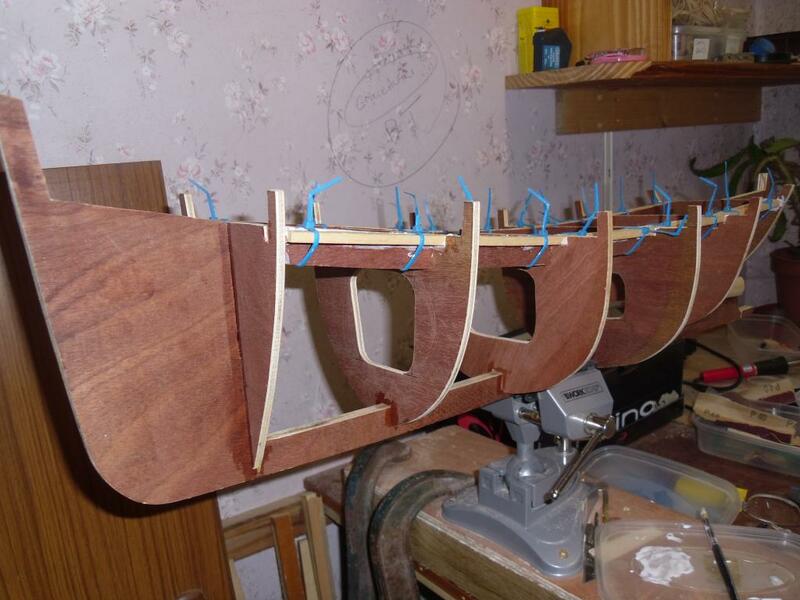 So I made a board up for the planking job which has pulled it back within limits, not sure how others build boats like Eileen, I must admit I am making all this up as I go along, please comment if you use a different method. 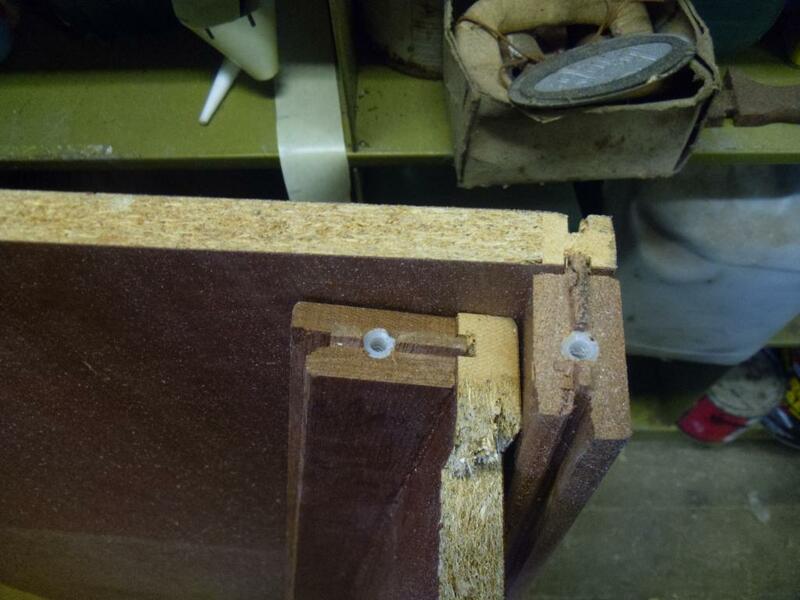 Angle irons screwed to the bottom of a piece of ply. 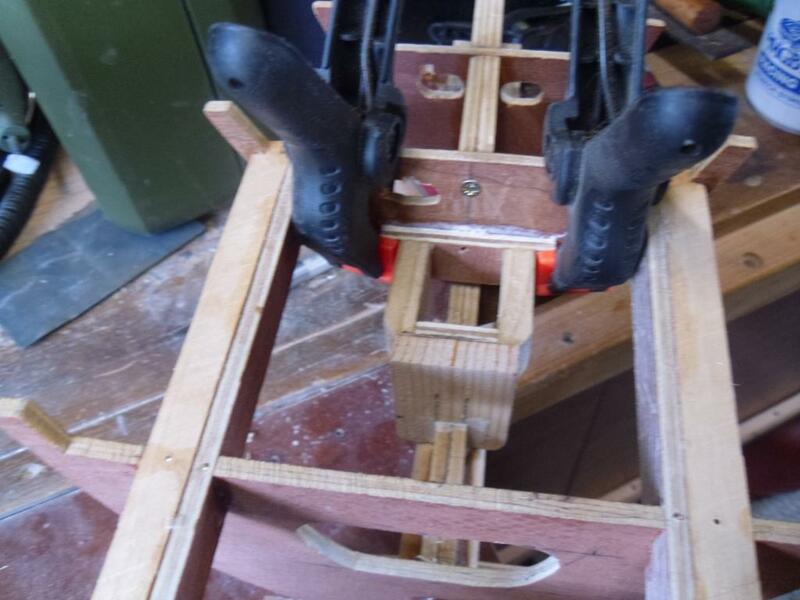 chocked under and clamped on top. 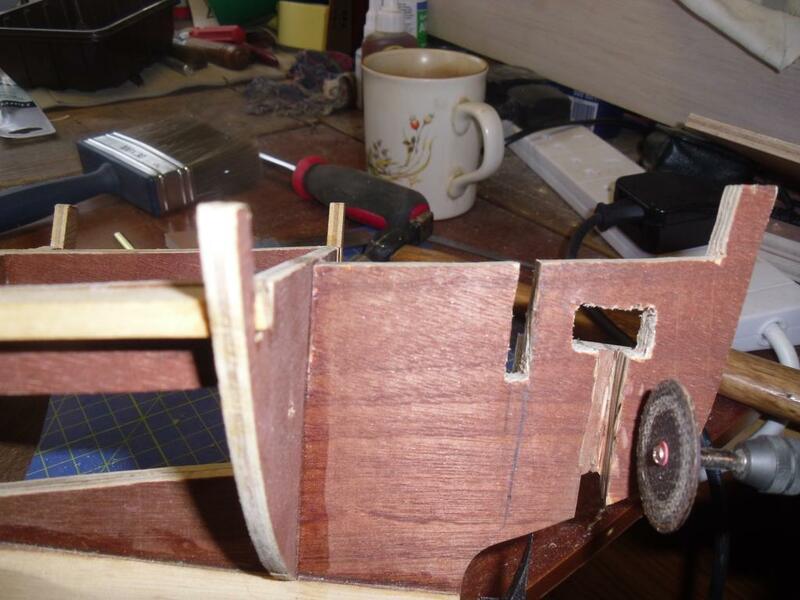 A little more done here, I have put in the motor mounting shelf, U?J on the prop in reediness. 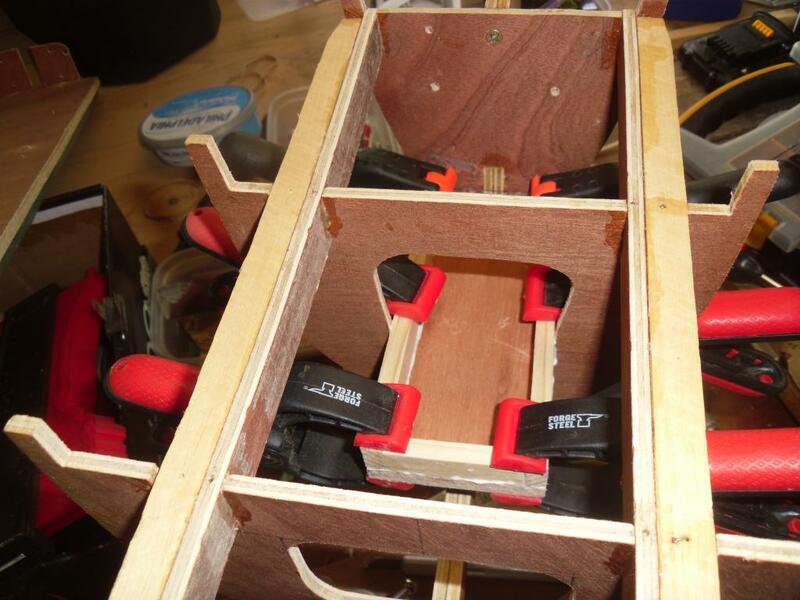 Also the start of the battery shelf. 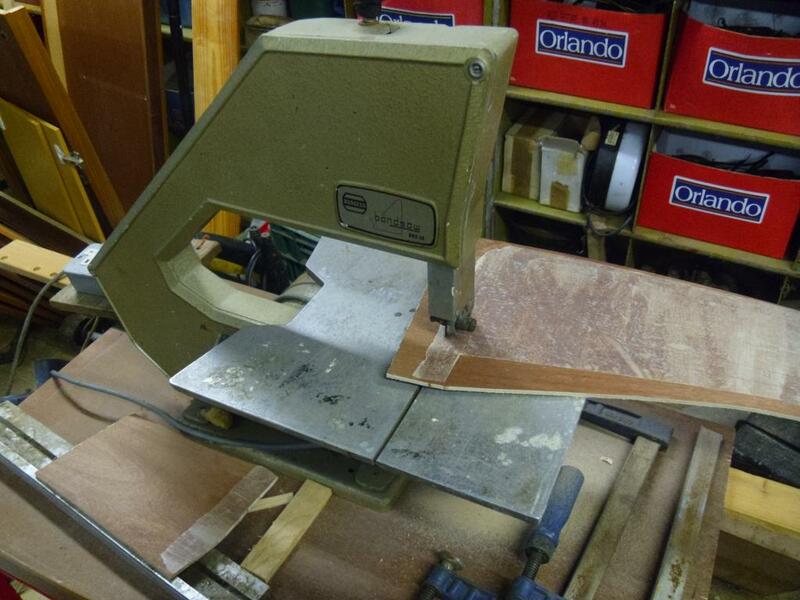 Not a great deal I can do now until I see an engineering pal of mine who is going to make up a two part rudder assembly for me. 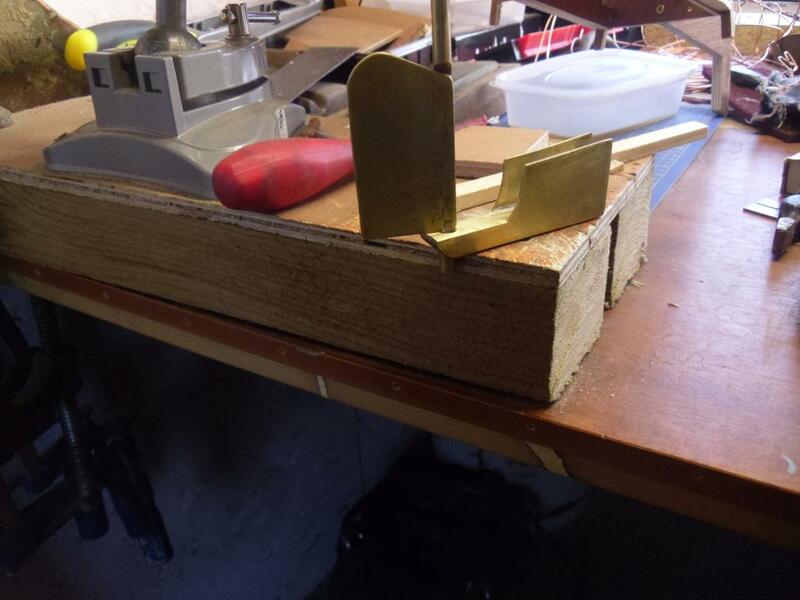 The rudder shaft is to have a slot machined to take the rudder and will be secured with a couple of grub screws, much like a throttle assembly of a carburettor. 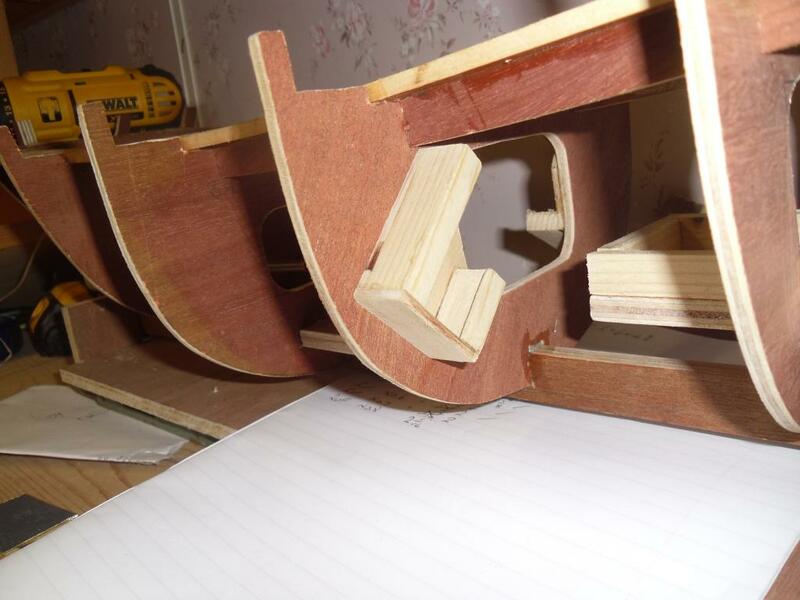 Coming along very nicely indeed Paul. My wife gave me a present yesterday just to cheer me up. A large bag of elastic bands. My Son came round just to take the lift! with a load of cable ties. Suppose it makes a change from grapes. 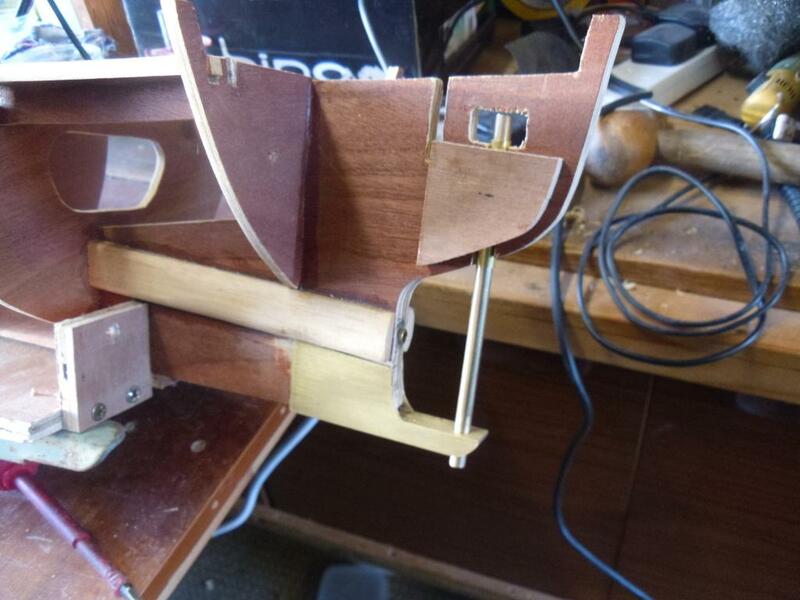 A little more progress today, fitted the last and smallest bulk head but not glued yet as I need to cut holes in both the centre board and the this bulk head for the rudder post and it's control connections to the servo. 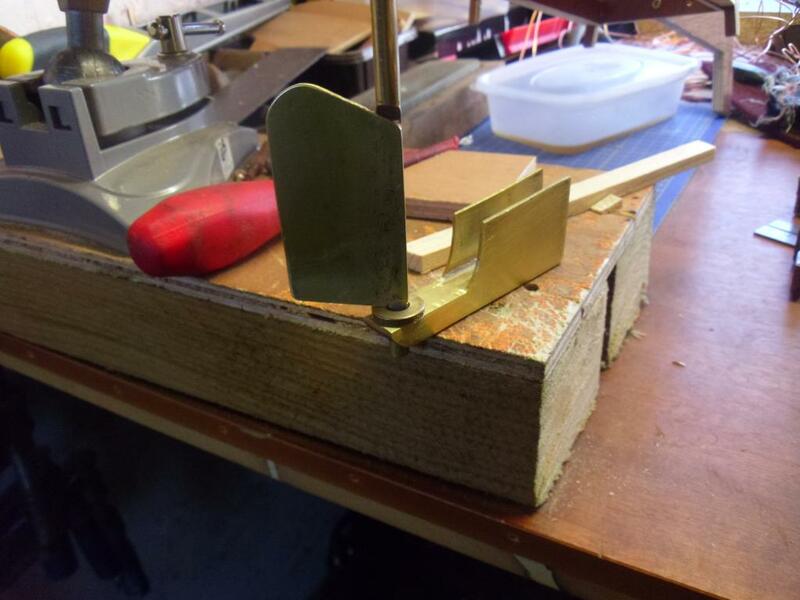 Also I was to strengthen the Skeg I believe it's called, the sticky out bit for the lower end of the rudder post, but have decided to cut away the wooden Skeg and use two brass plates (first photy is them rough cut) and solder a solid piece of bar between them, this will make things easier especially fitting the rudder itself. 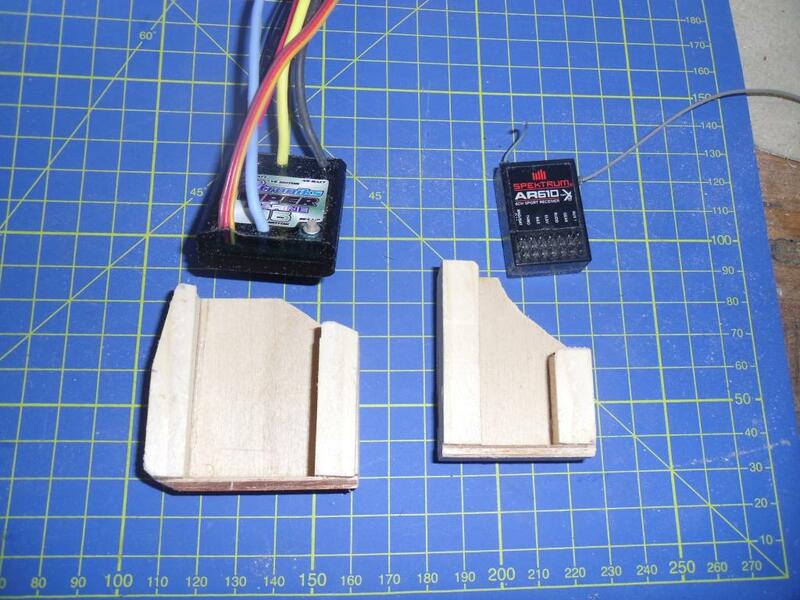 Also started making holders for the receiver and the ESC. 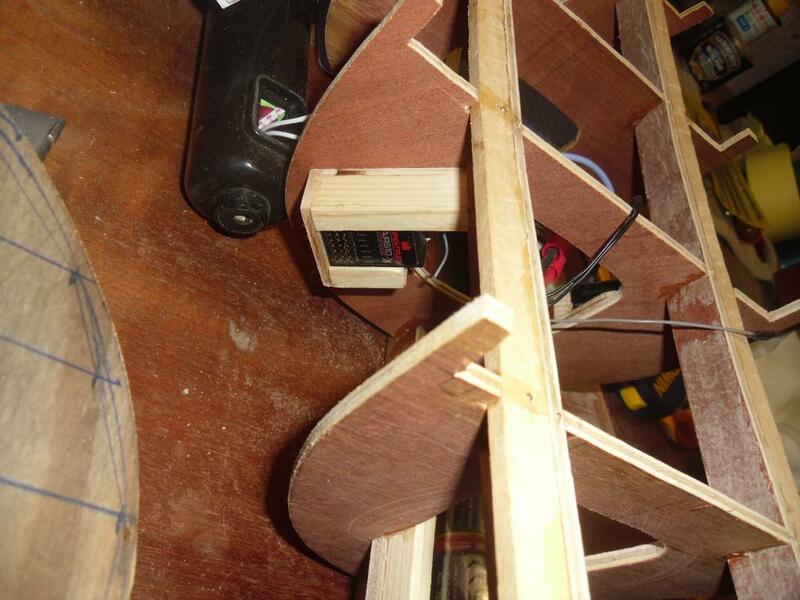 Finished and fitted the little pockets for the receiver and ESC. 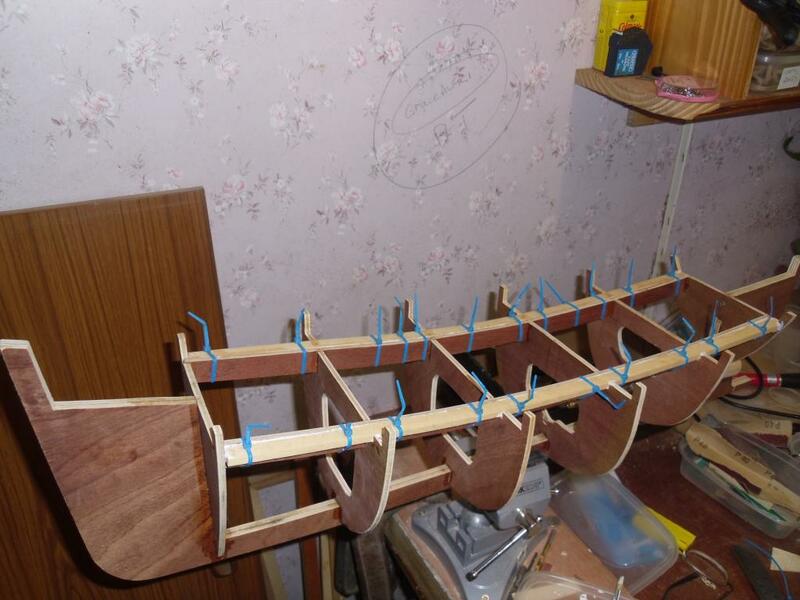 Getting the rudder position sorted now, I'll see my friend tomorrow who is to slot the brass rod for me. 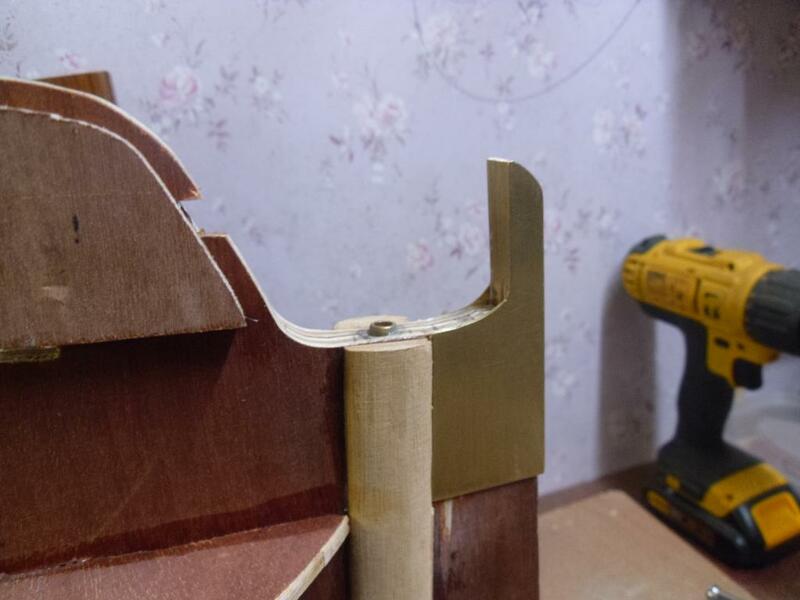 I have cut removed half the slot for the tube, then placed a bit of ply for strengthening over it, when it's set I will do the other side. 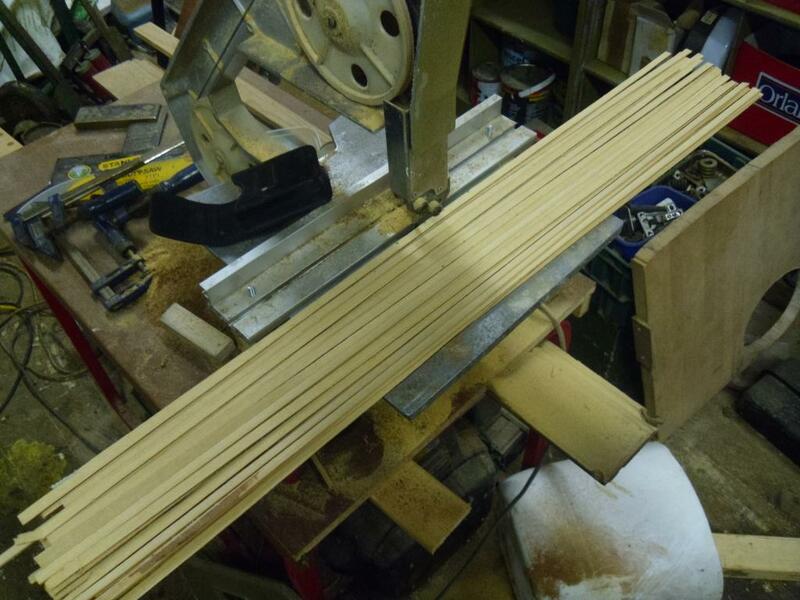 Also roughed out holes for the rudder control rod. 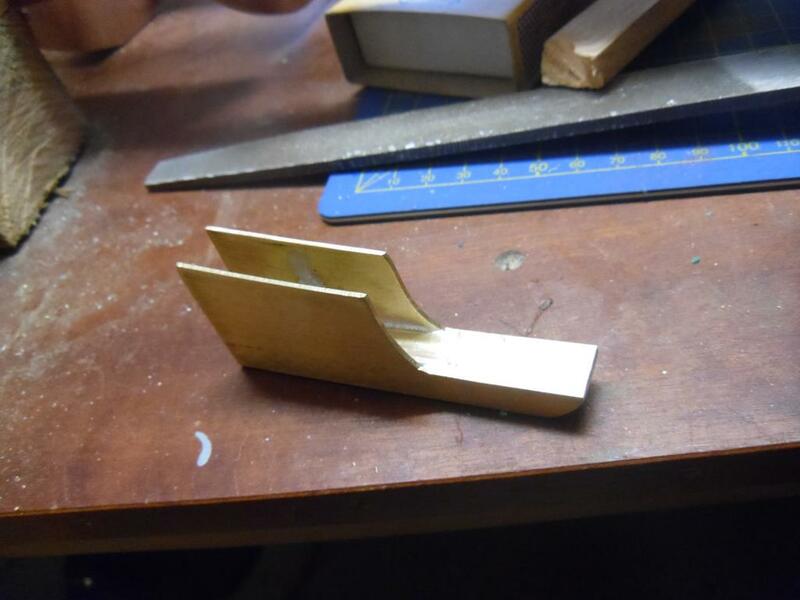 Cut the slot for the rudder tube and plated it over with another piece of ply, I have left the brass tube out until I get the rudder and brass skeg made up so as to make sure they are fitted together and in a true line. 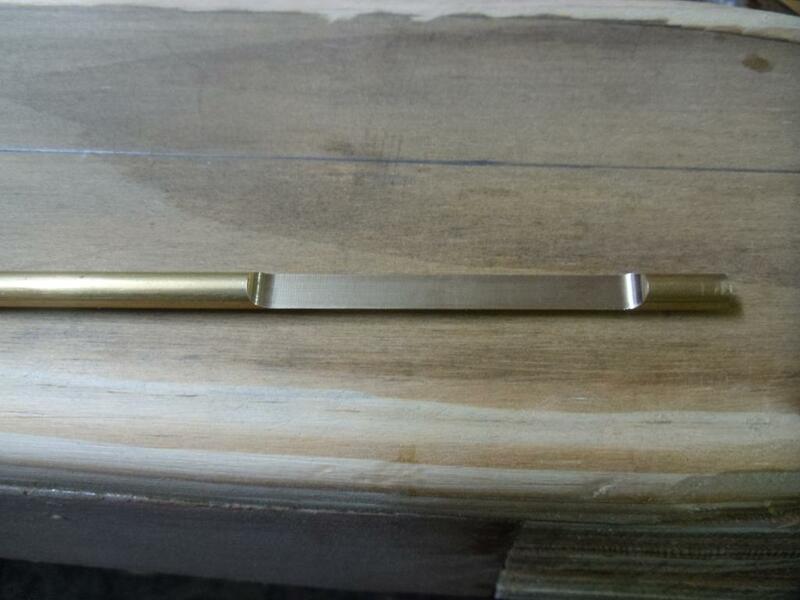 I am replacing the skeg with a brass bar with brass plates soldered to it, made this today and cleaned it up ready. 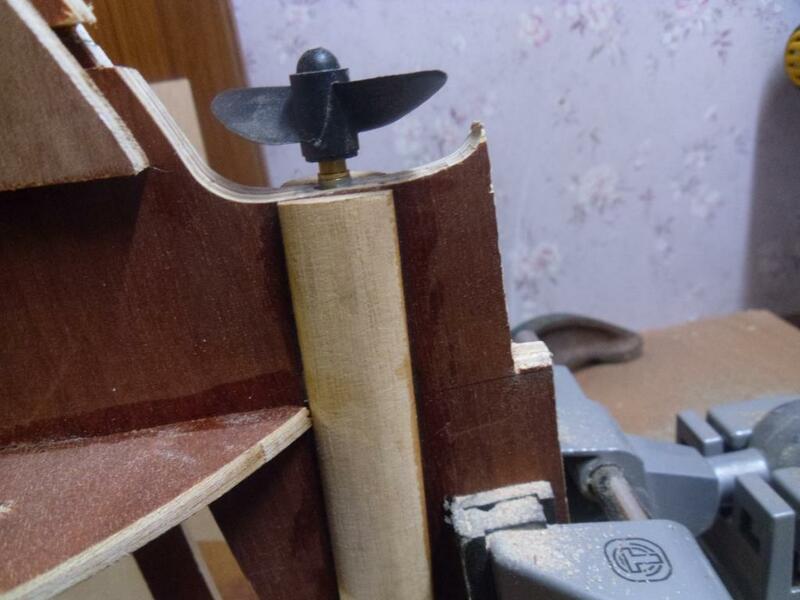 The reason for this move was that I caught the skeg and almost snapped it off, you can see the repair in the first photy. 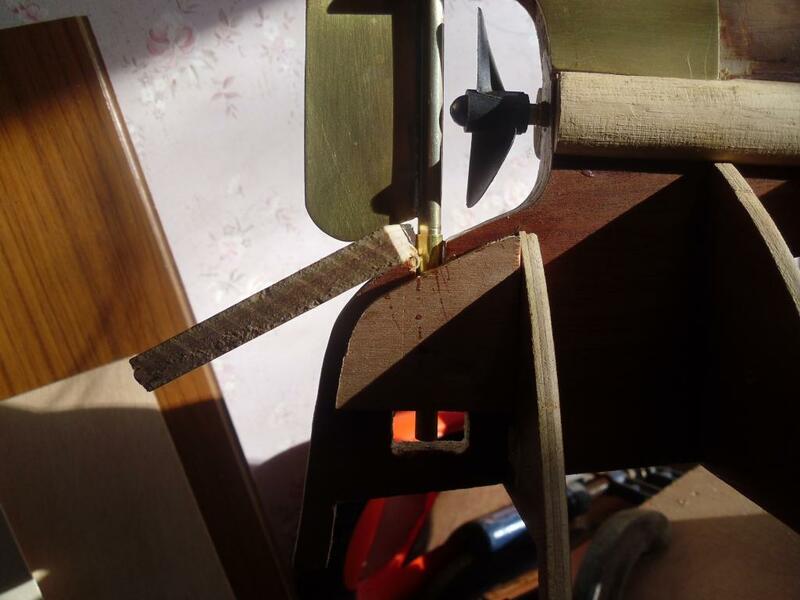 My efforts in brass and soldering. Lining it up ready for surgery. I had to bite the bullet and cut it off. Then rough out where it was to fit. One of the many trial fits. Now to clear up the mess. 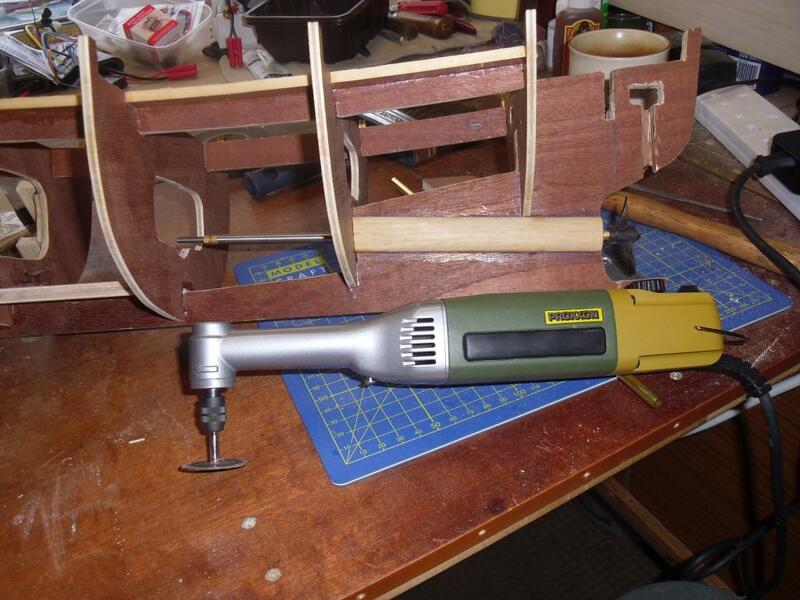 I will drill and screw in place once the rudder is fitted and probably glue or use epoxy resin stuff, not sure quite yet. 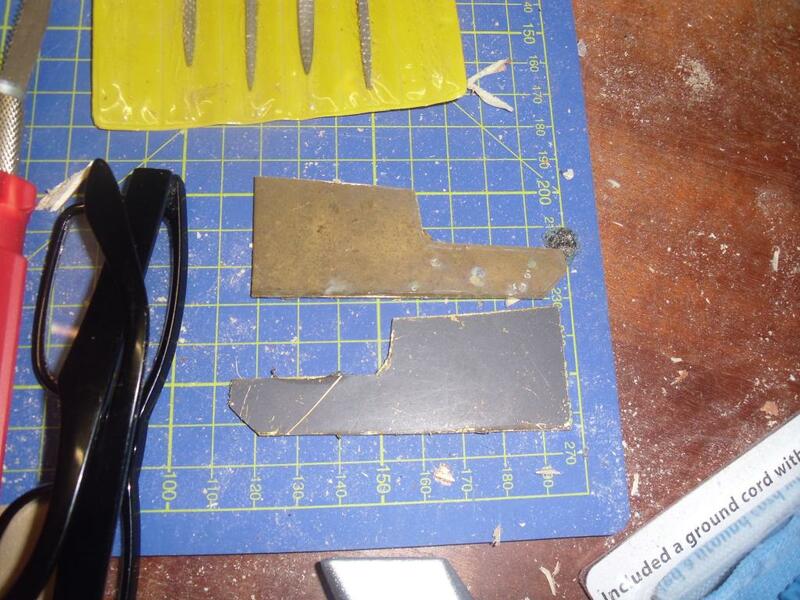 I would use resin and then screw in, stops any water that might find its way into gaps making a good seal. 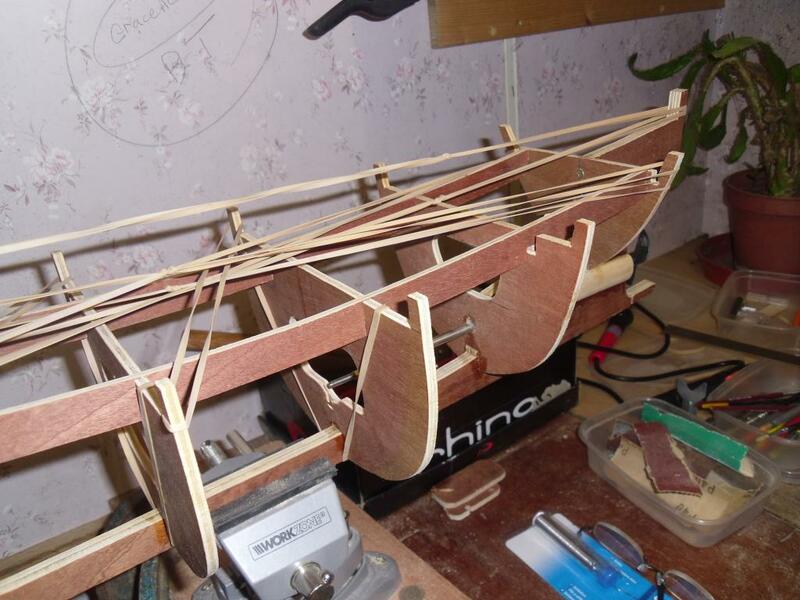 I always try to leave it so that I can remove the rudder if necessary. 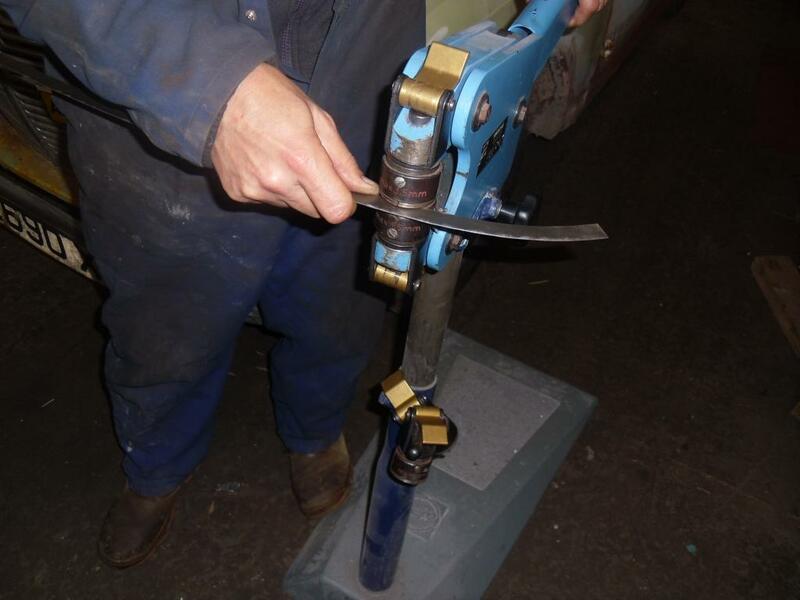 Sometimes that's the only way to remove the propshaft. 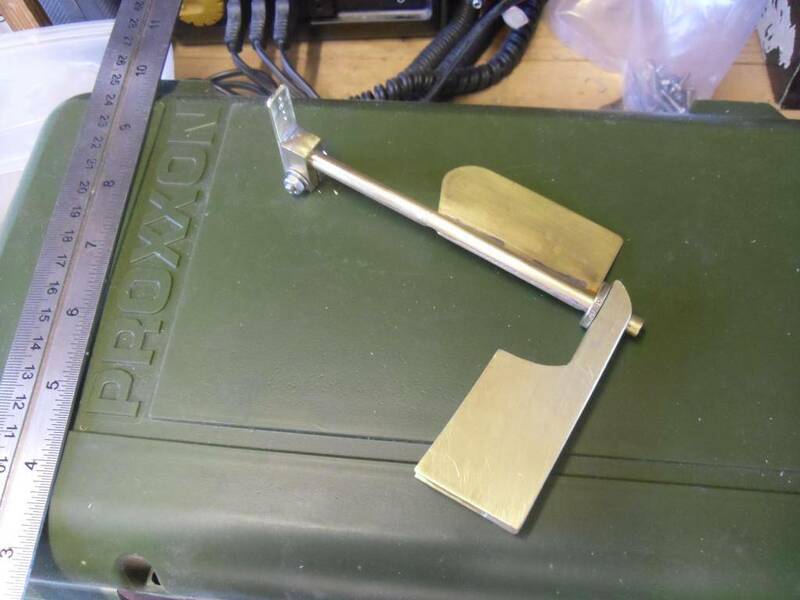 Thanks for your thoughts chaps, Epoxy Resin was my choice but as Barrie says I may need at some point to service the rudder or prop. so I will have to think a bit harder or I might cause a problem. 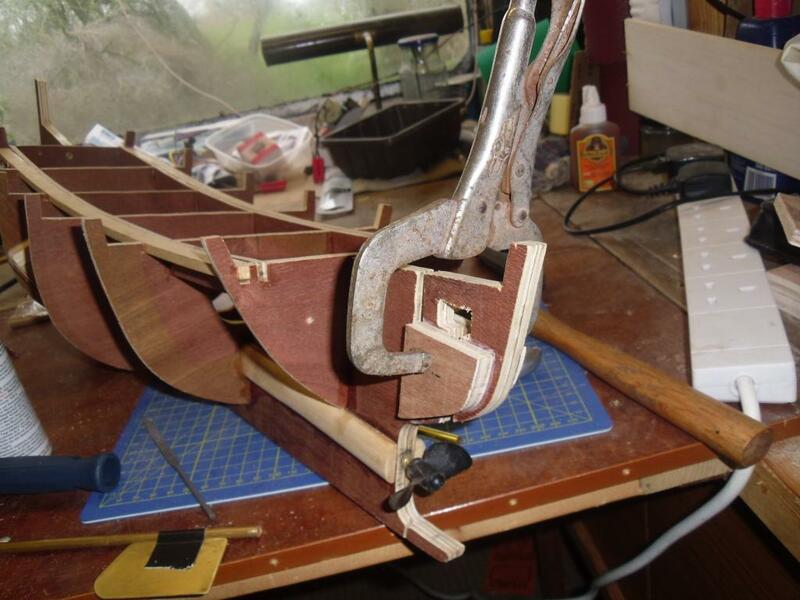 That's an interesting way of making a rudder. 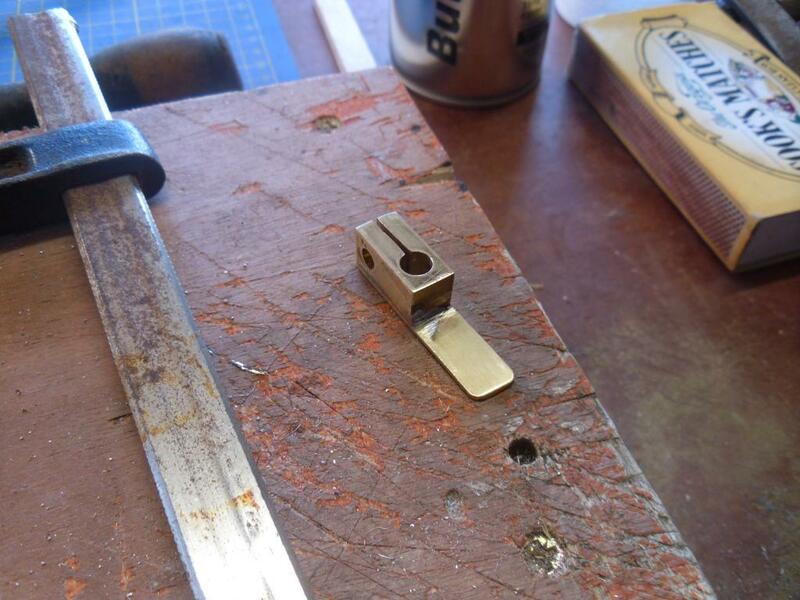 I usually just solder the blade to the shaft with soft solder. I haven't had one come adrift yet. 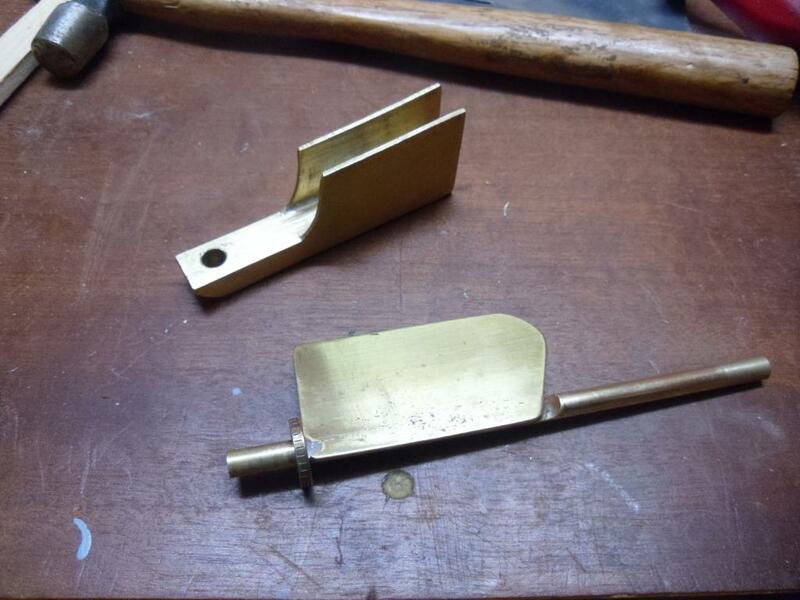 I have tried silver solder but my torch isn't strong enough for something as big as a rudder. 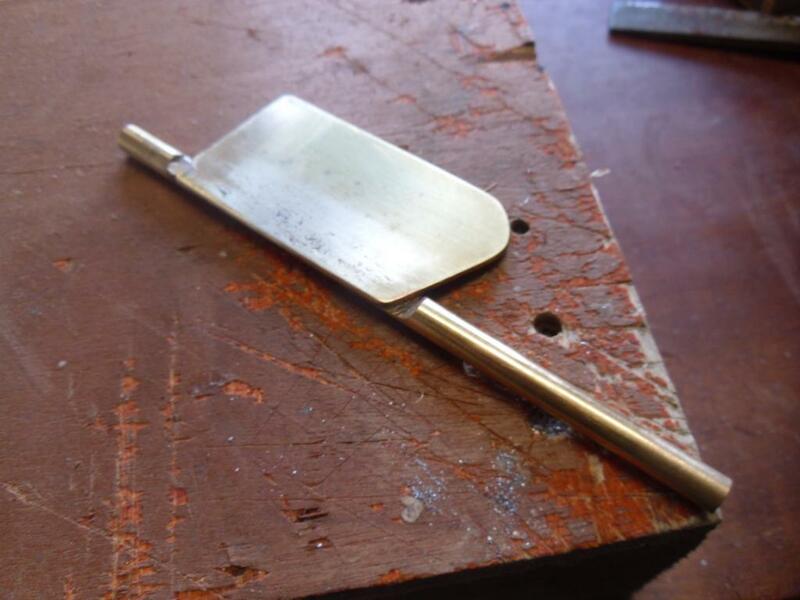 I had lots of thoughts on this Barrie and this was the decision, a flat surface gives an easier place to solder it, soft solder is what I will use but probably will go silver solder in the future. 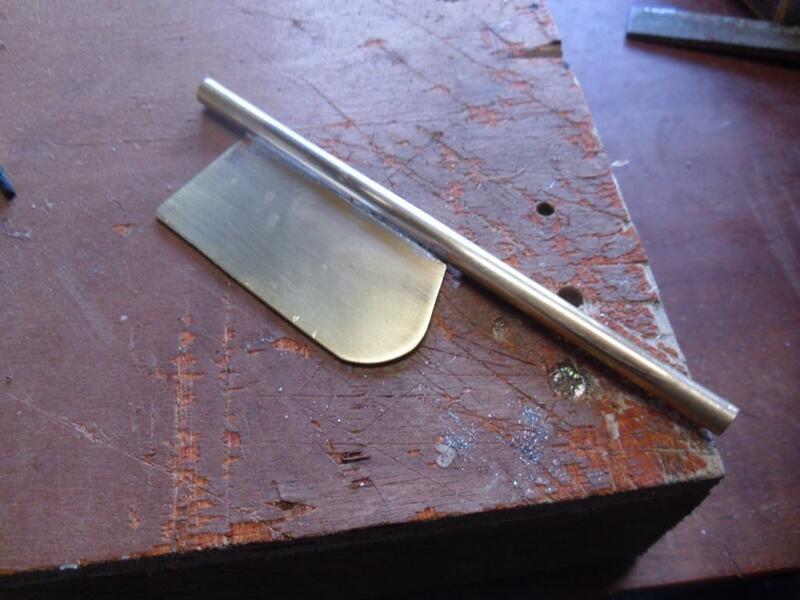 The little welding set will make it easy for silver soldering and the advantage is that there are several solders with different melting points which I will be using in my copper art projects. 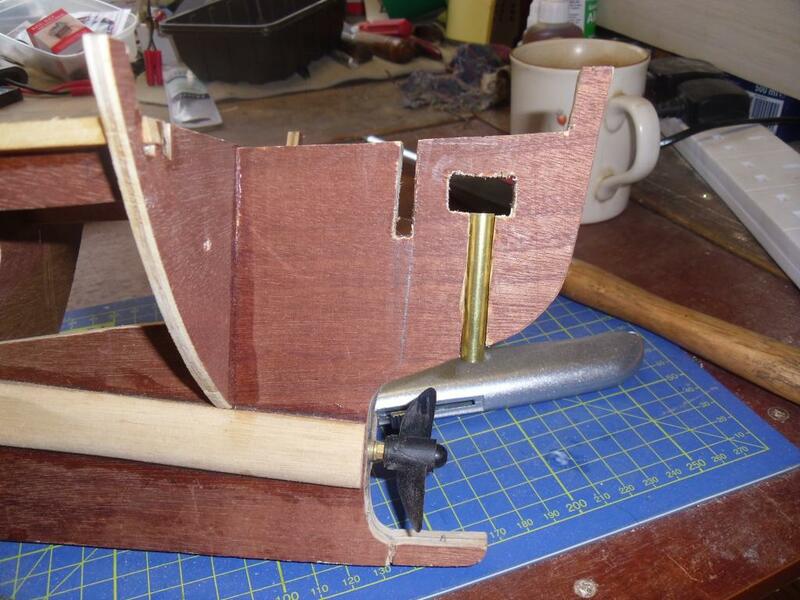 I'm not sure how much it would affect the steer of a boat by putting the rudder on one side of the shaft. 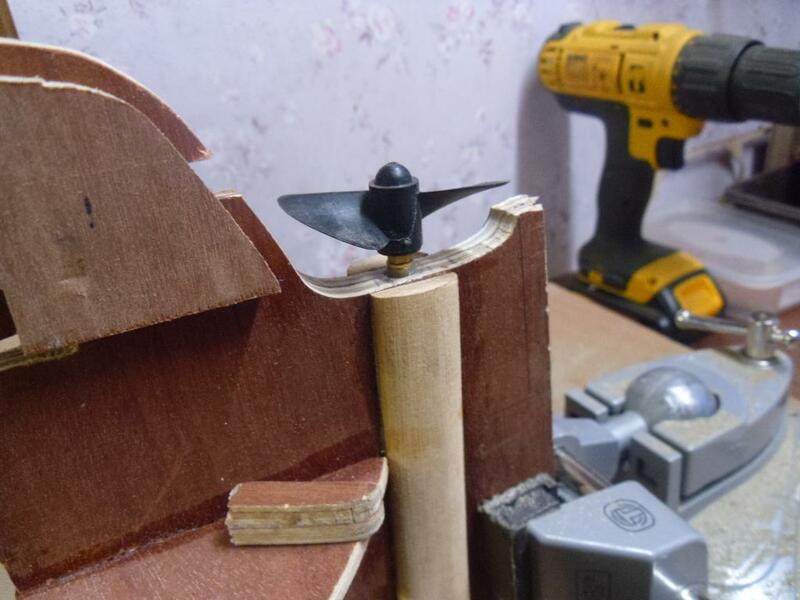 Ideally the prop needs to be central to the propeller and I would imagine the longer the boat the more its effect would have, my next one is going to be 54inches long so I think I want to avoid any chance of problems. Perhaps I am being over the top in this, it's just the way I see it. 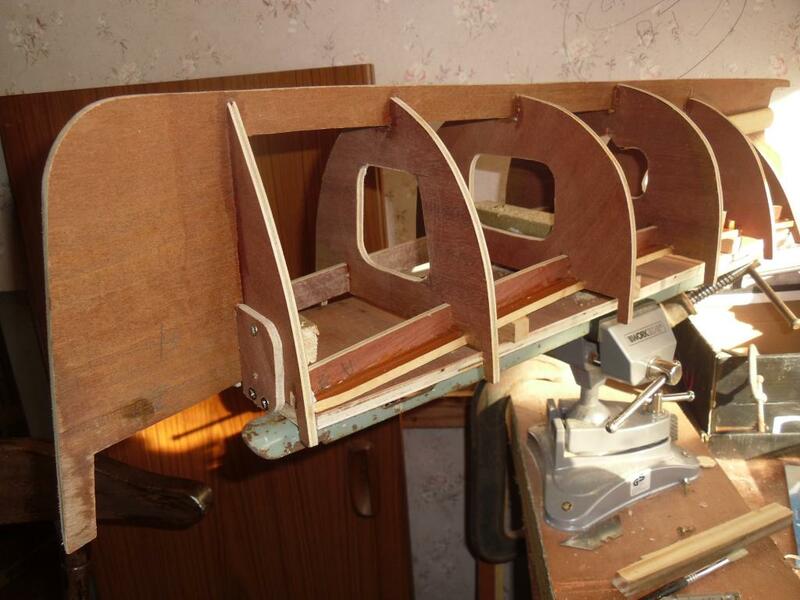 Been doing a bit on the rudder etc. 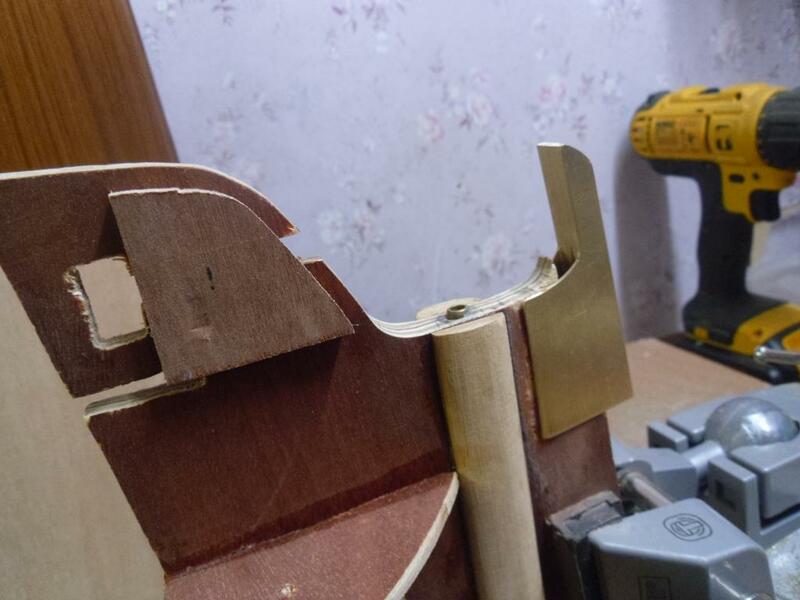 today and made some progress. 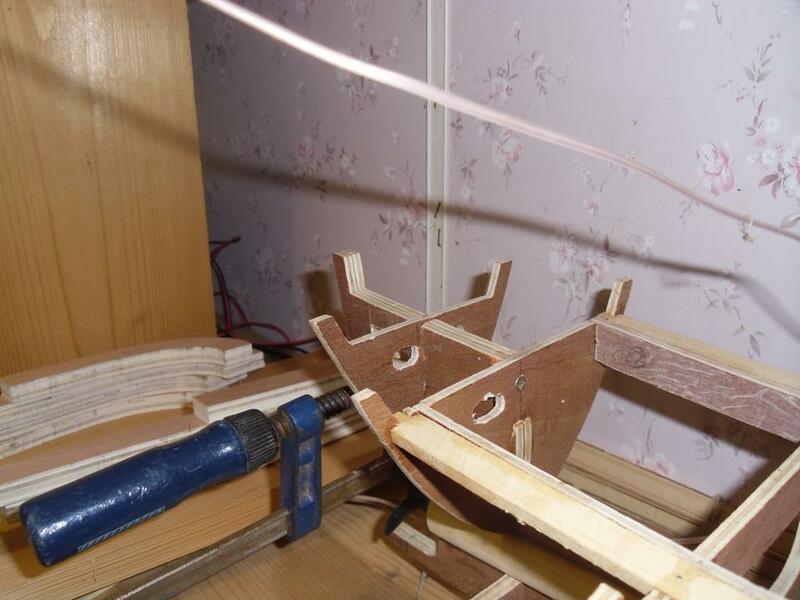 First I made the shaft fit and the upper guide tube. 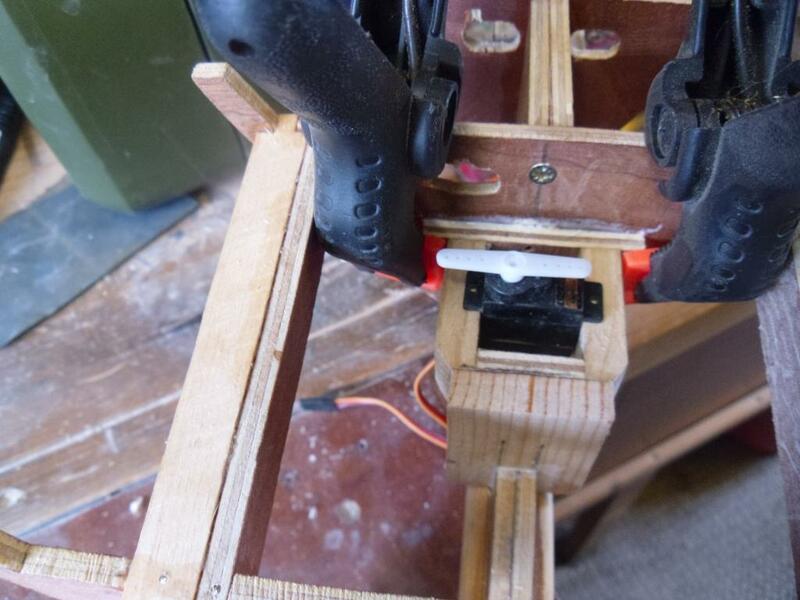 Soldered the two bits of the rudder together. 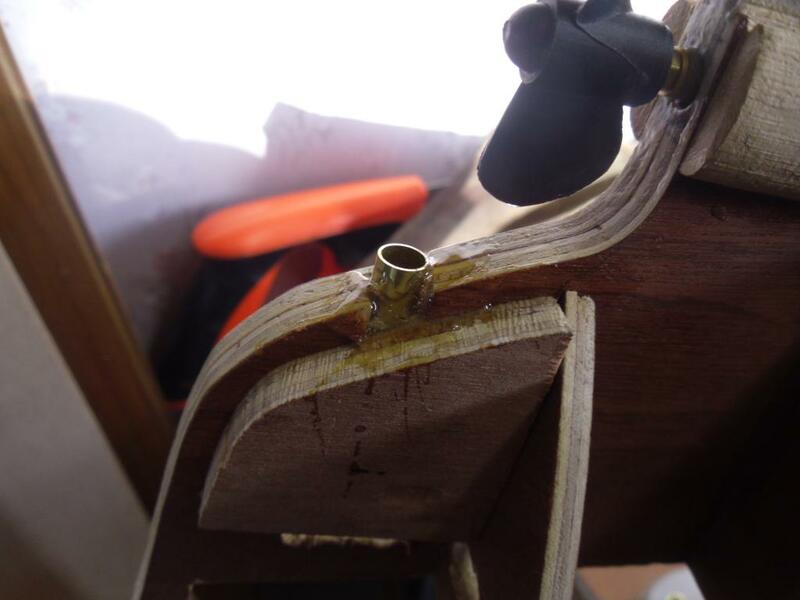 Then set the tube in epoxy resin. When it had hardened a little I removed the shaft and put some more epoxy resin around the tube just to make sure, then cleaned some off before it set fully to make things easier. 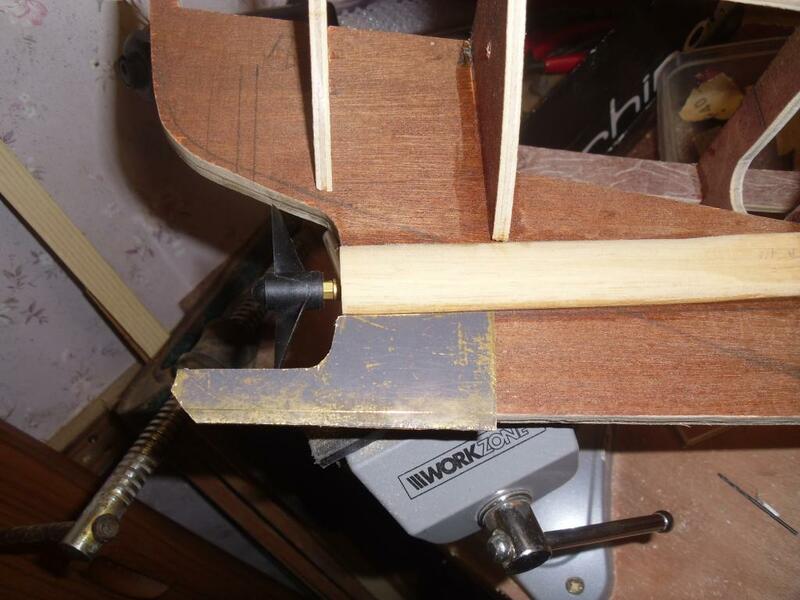 With the rudder in the loose skeg I thought it a bit low and might bind. 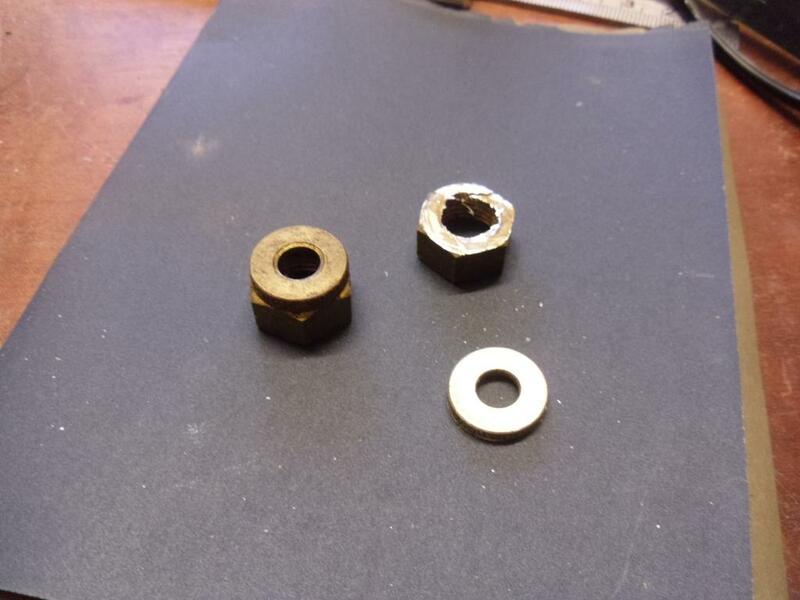 I needed a spacer and couldn't find a suitable non ferrous washer, so I made one from a tube nut (gas pipe fitting). 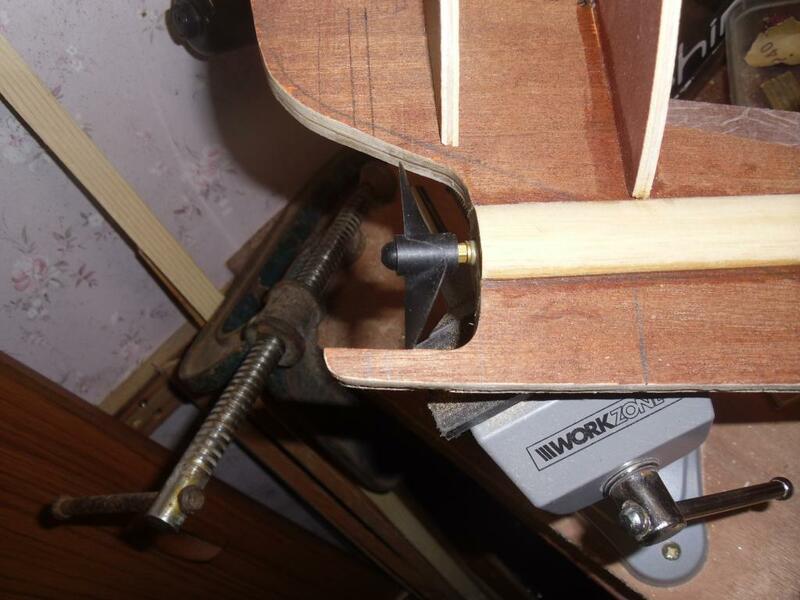 Newly made washer/spacer in place. Soon be ready to have a go at the planking never tackled this job before, so I'll take it slowly and see how it goes. Any tips anyone has would be useful. 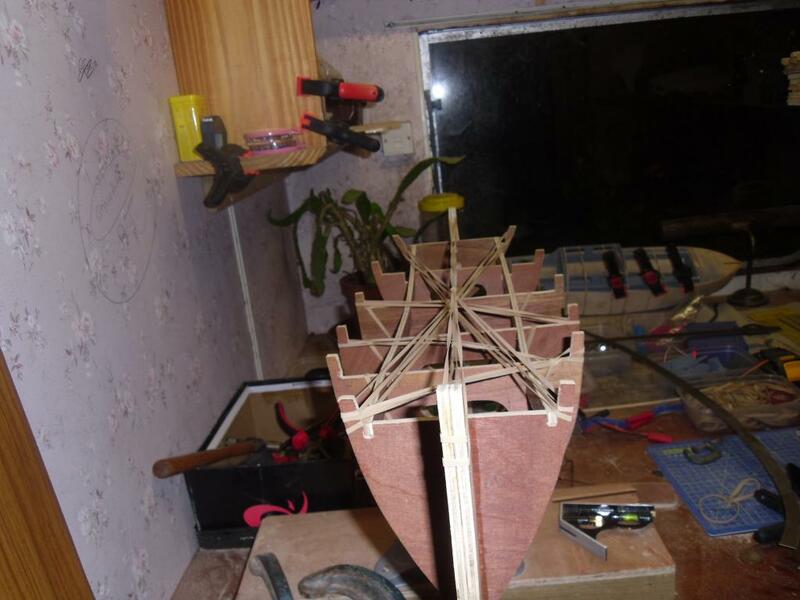 A little more progress today, I made a lever arm for the rudder. 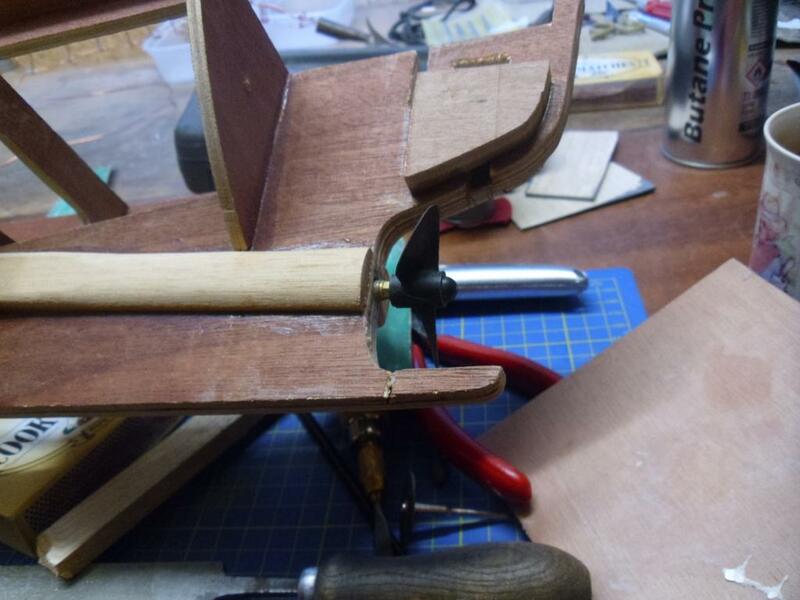 I was going to use a wheel collet but decided against it, when I drilled it out to the size required I didn't think enough thread was left for the grub screw to make proper purchase on the shaft, I had a feeling that the thread might strip. 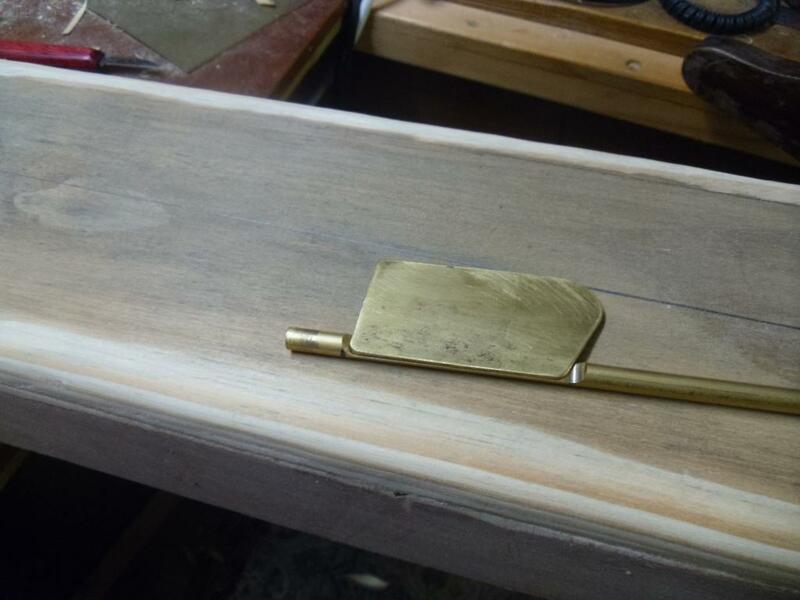 I drilled two opposing holes in the end of the bit of brass left over from the skeg, 3/8square I think, and cut a small suitably sized strip of 2.5mm brass from a sheet I have and soldered them together. 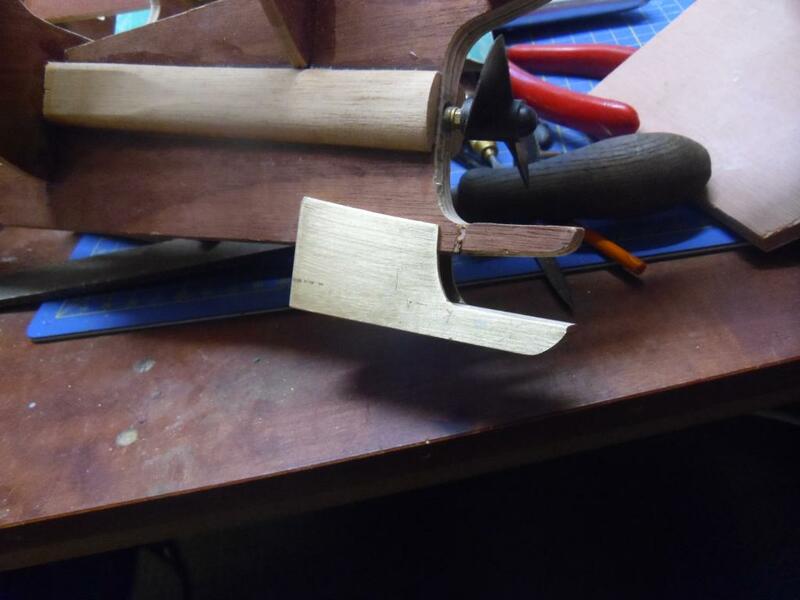 Then cleaned it up and cut a slit with a hacksaw through to the second hole turning it into a clamp. 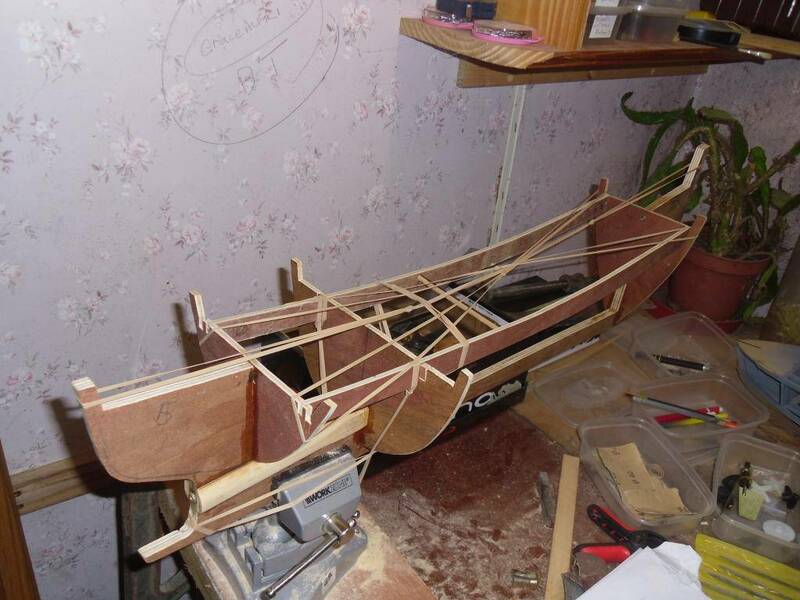 Here it is with 4mm nut and bolt along with rudder, skeg and all. 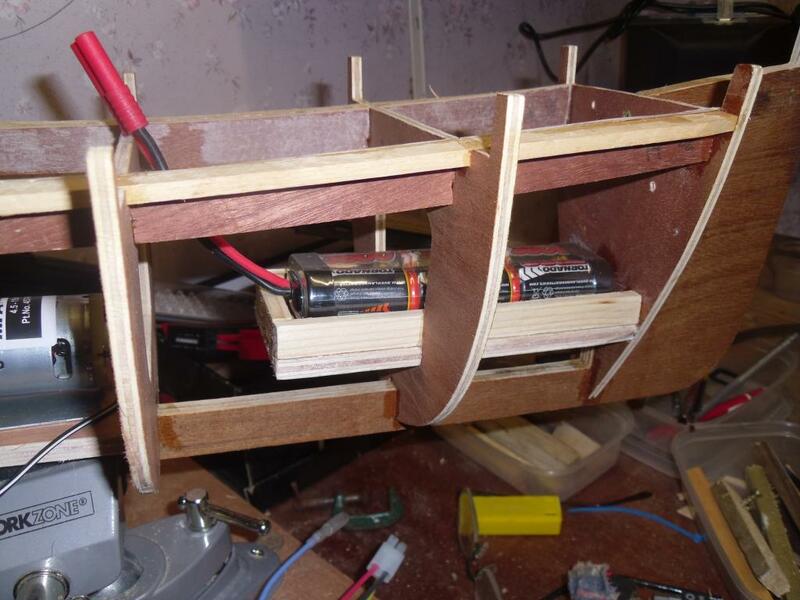 Did a little more yesterday, I needed to get the rudder and servo link sorted so had to make a mount for the servo. 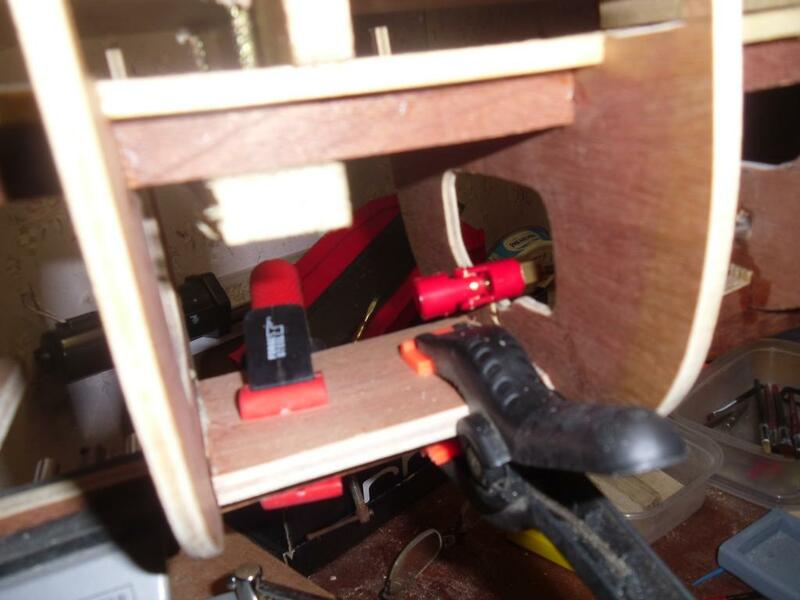 I like these to be adjustable as it makes life easier when making the rod, as long as the rod is somewhere near the length I can then move the servo till it's spot on and central, saves removing that little screw that holds the servo arm for realignment. 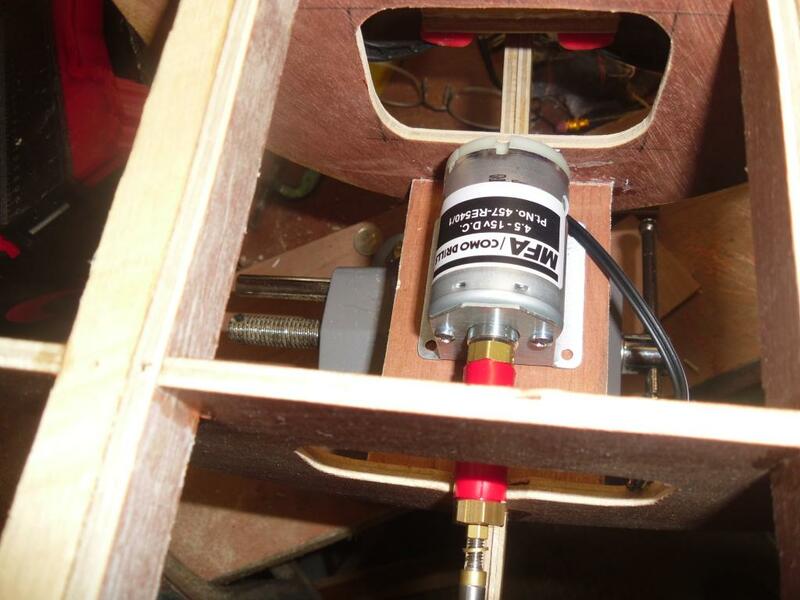 Servo in place, it can slide in and out to get the correct position. It just makes things easier Damien, might give others a bit of help too. I get lots of tips on stuff by reading other folks threads, it's a way of giving back. That's why we're all here to learn and share this is what makes a successful forum Paul some I don't visit anymore belittle other members that makes for an unfriendly forum this one will never be allowed to go that way. if I can learn something new each day I'm a happy fella. I do intend to get back to my models at some point but I am afraid life is in the way at present. 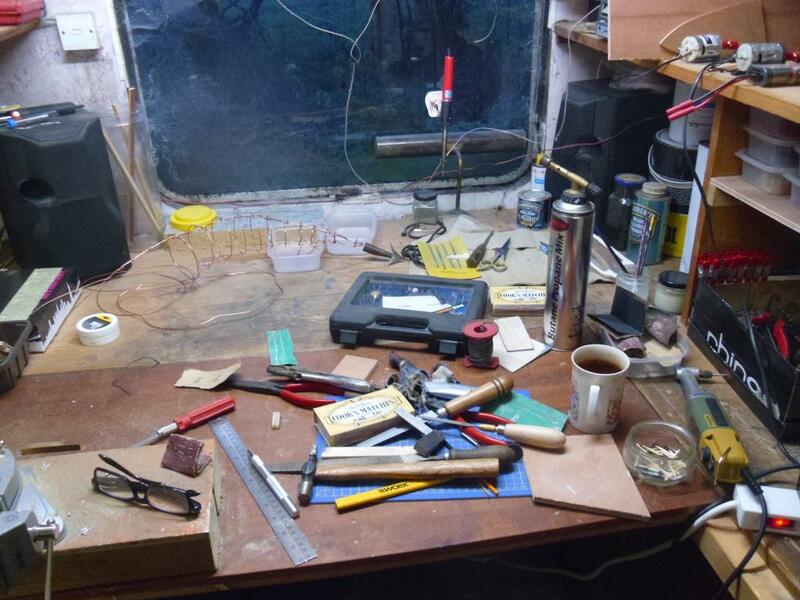 I have had to move my work space to another location for the models and just had no time to sort it properly. 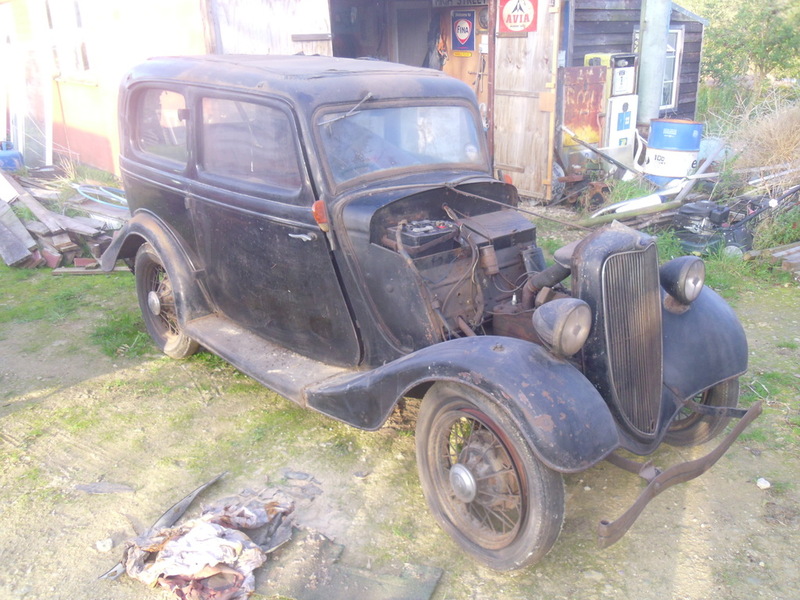 I also have other projects I am doing, mainly classic cars and at present I am putting a 1937 Ford Model "Y" back on the road and hope to have it mobile in the spring, I have 90% of the parts I require, just need to keep fitting them. Morning mate quick question if I may don`t know if you will remember. 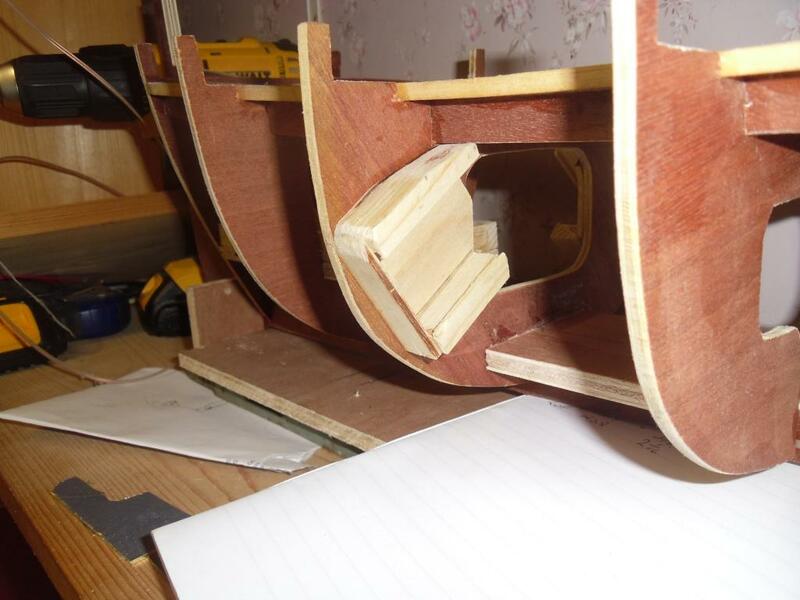 When you cut out the bulkheads did you have to trims the tops down I`ve traced mine off the plan bulk no1 is 10mm higher than the slope coming off the bow. 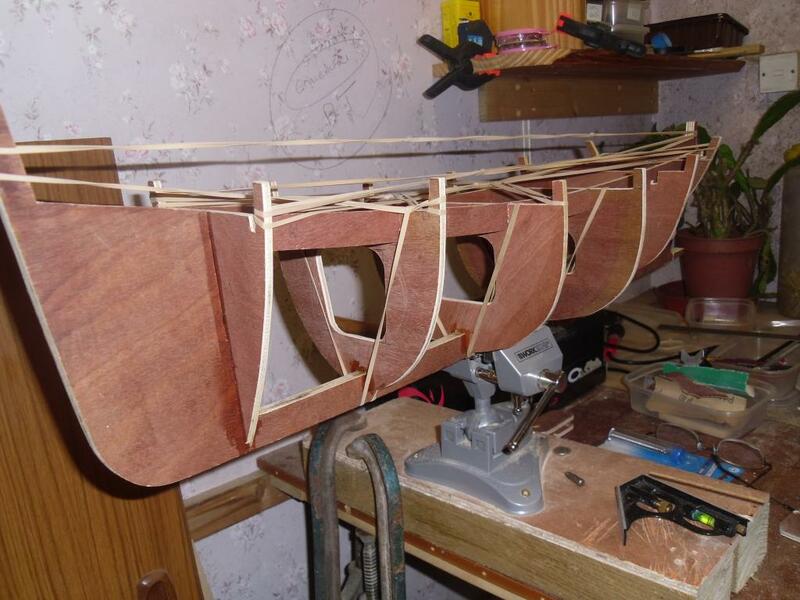 I noticed yours is flush with the top which is making live difficult to fit the sheer boards broken two (balsa).What thickness ply did you use for the keel and bulk heads at the moment I`m using some spare balsa and to me its going to be very flimsy. I can't quite remember but it was traced off of the plan as you did. 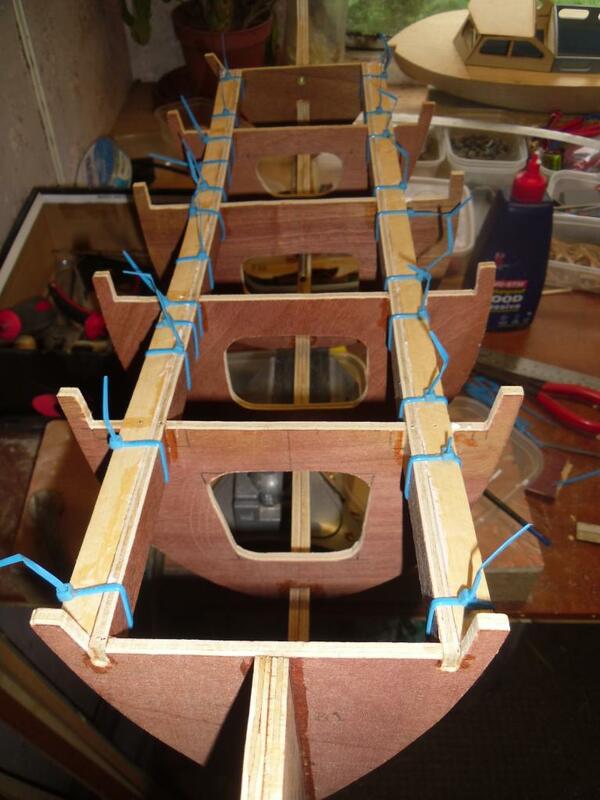 does it look to be in correct alignment with the keel for the planks to fit to ? 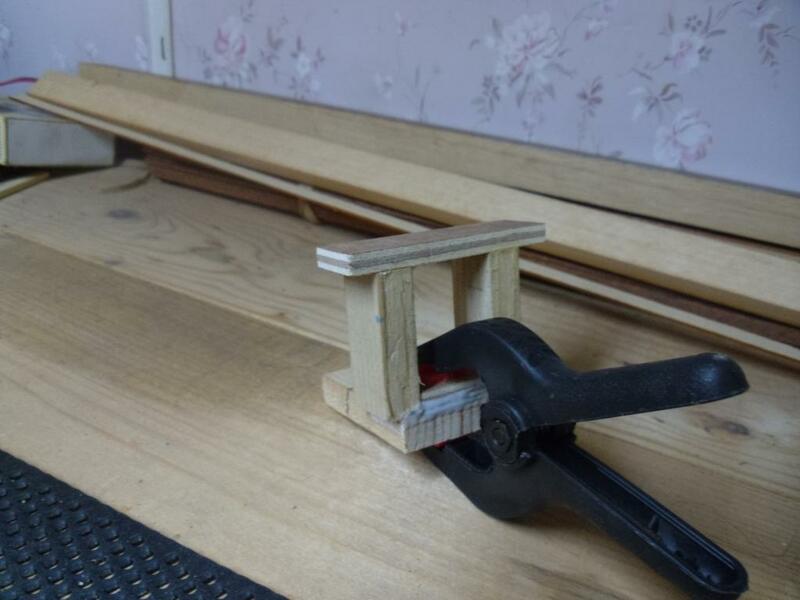 1/4inch ply I think, it's all made from scrap wood I had laying around, I love recycling stuff. 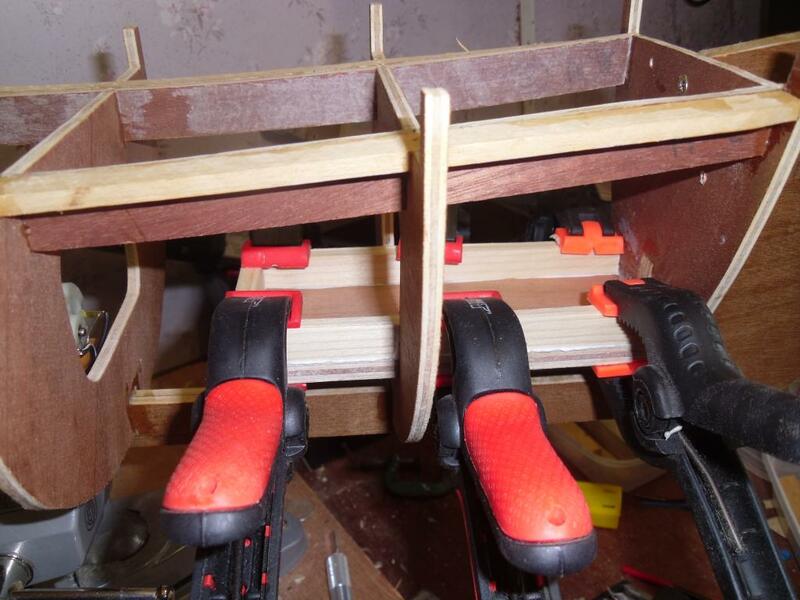 Have you thought of making a build log (photo log) for others to see, it helps us all as we all do thing a little different and this to me is especially helpful in the my learning curve. 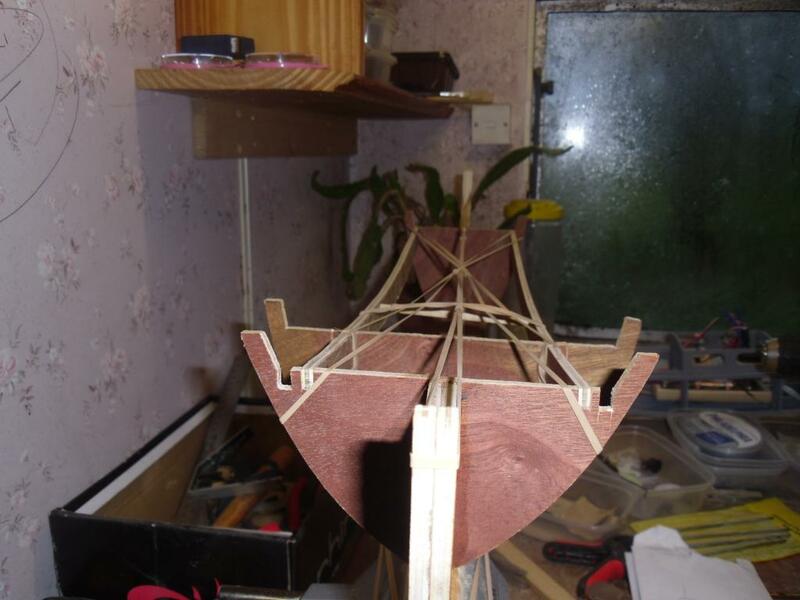 Hi Just trying to work it out at the moment using scrap balsa. 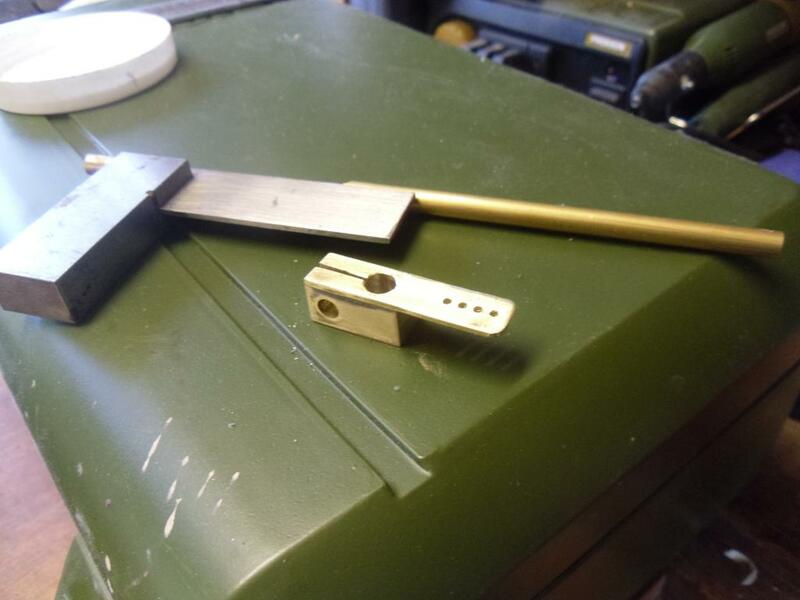 now cut 10mm off the top of bulk head 1 so it fits like yours. all bulk heads sit on the plank line just notice I cocked up lol couldnt understand why some of the bulkheads were higher so cut slots in them to get the sheer line to like right (I blame the pills) had bulk head 2 in postion no4 and 3 in 2 4 in 3 will now have to fill in the slots and try again will take a picture and upload it later when i figure how to load pictures. 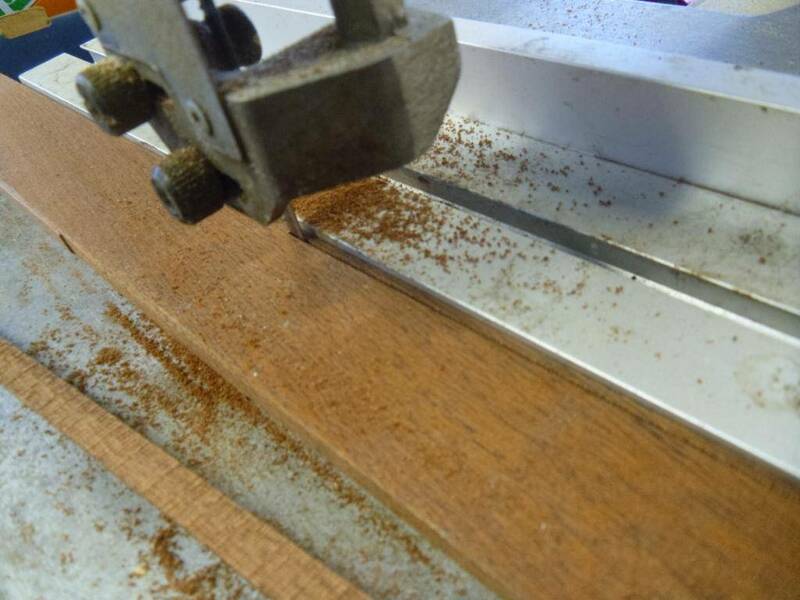 just order 9mm ply for keep and 6 mm for bulk heads marine ply.